One of the rides found in nearly every theme park, amusement park and carnival for the last half century is the Eli Bridge Scrambler ride. 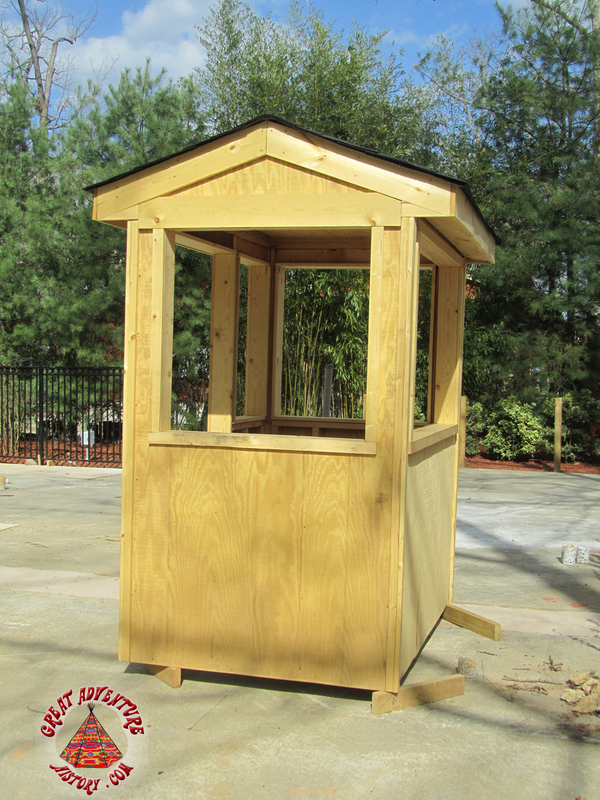 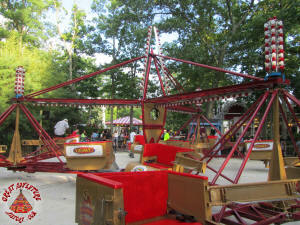 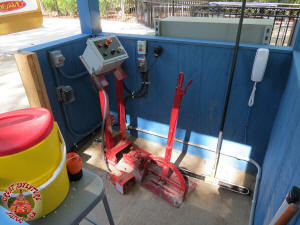 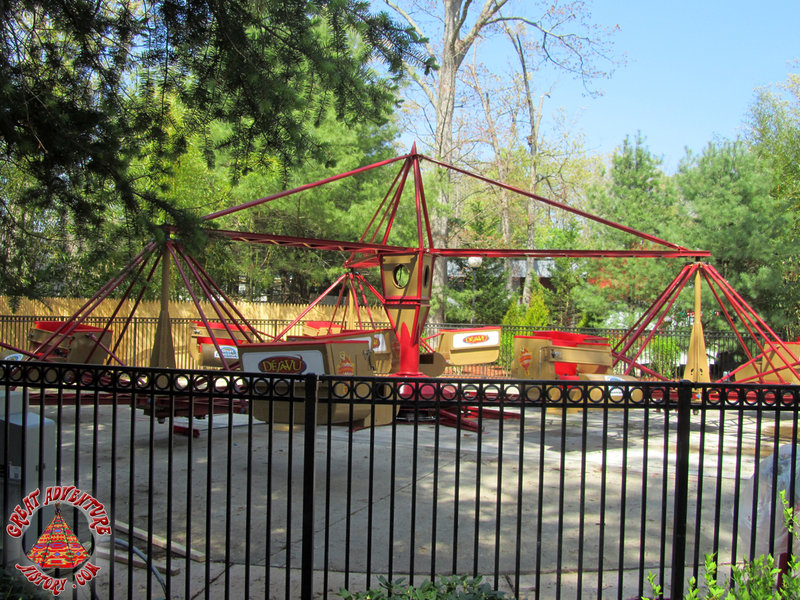 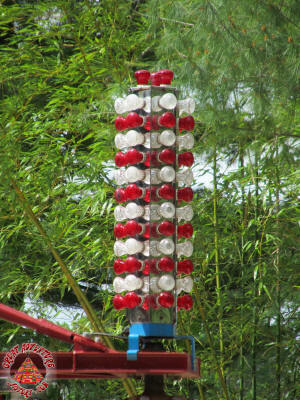 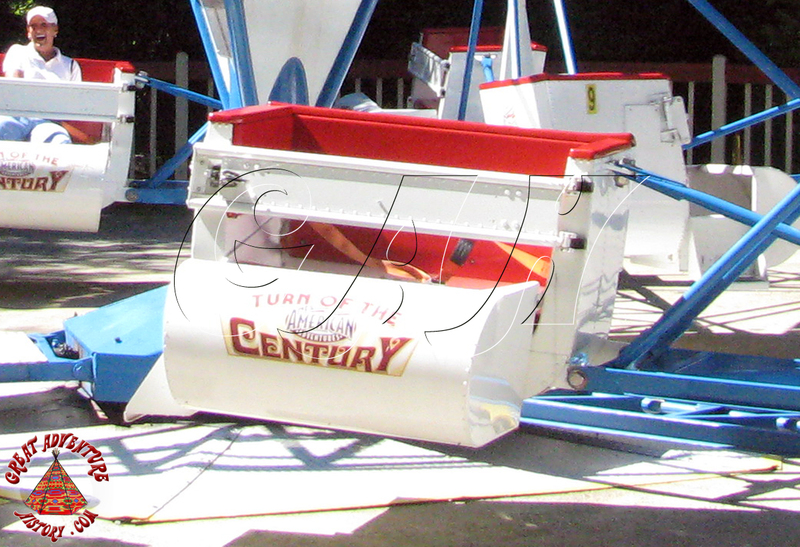 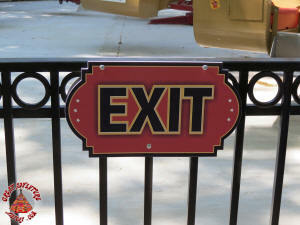 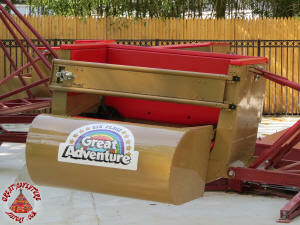 This simple ride is a crowd favorite, is mechanically simple to maintain, and can fit in a small area. 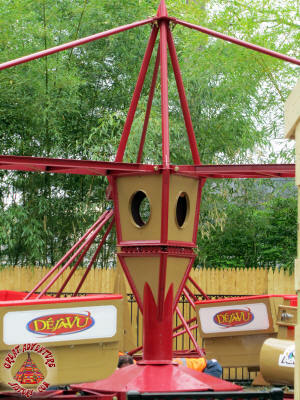 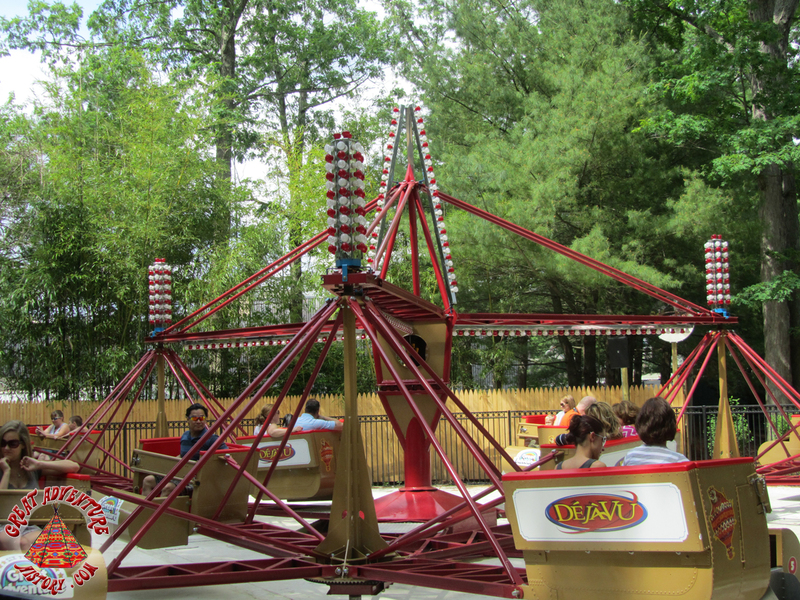 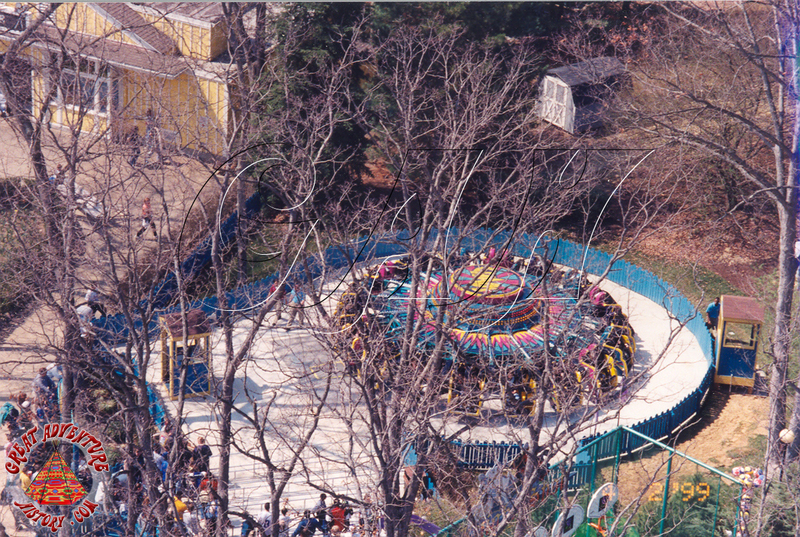 Deja Vu was placed on a ride pad that had been added in 1999 when the Chaos flat ride was built as part of the Great Adventure's "War On Lines" - one of more than twenty five new rides added that season. 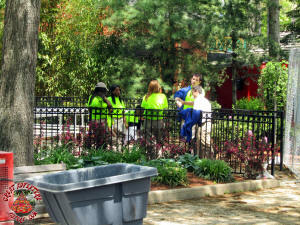 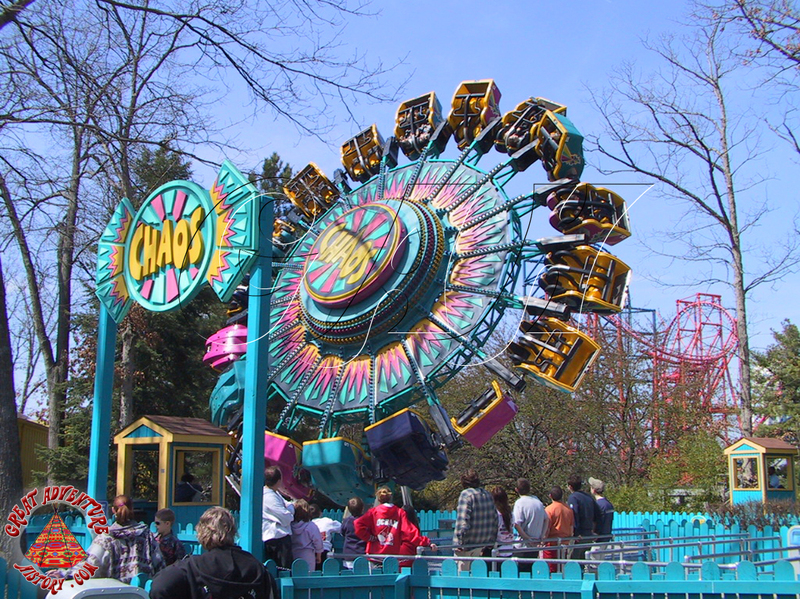 The Chaos was removed in 2005 after the ride model had been the subject of several safety and maintenance issues at other parks, though Great Adventure's had operated with no incidents. 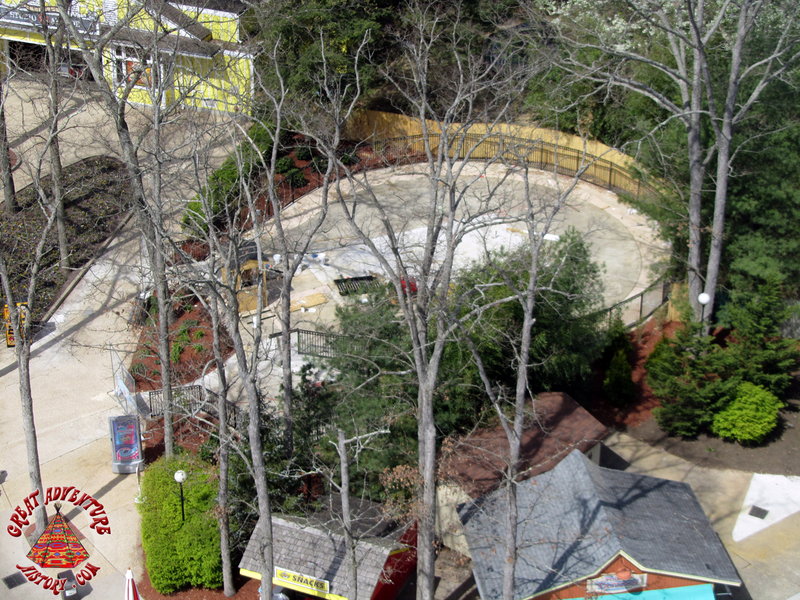 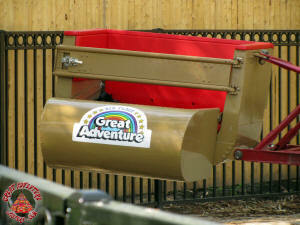 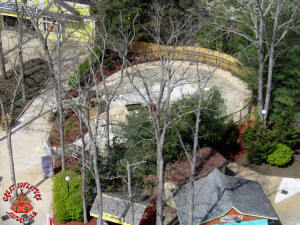 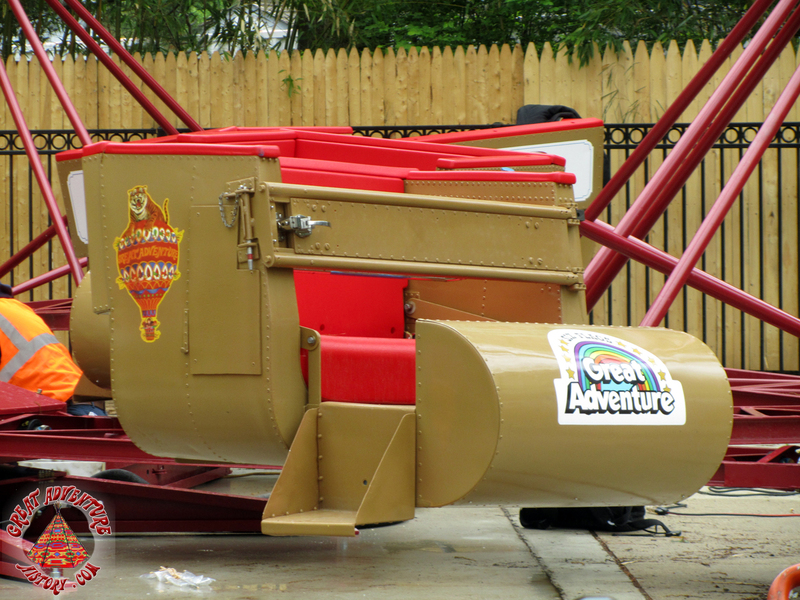 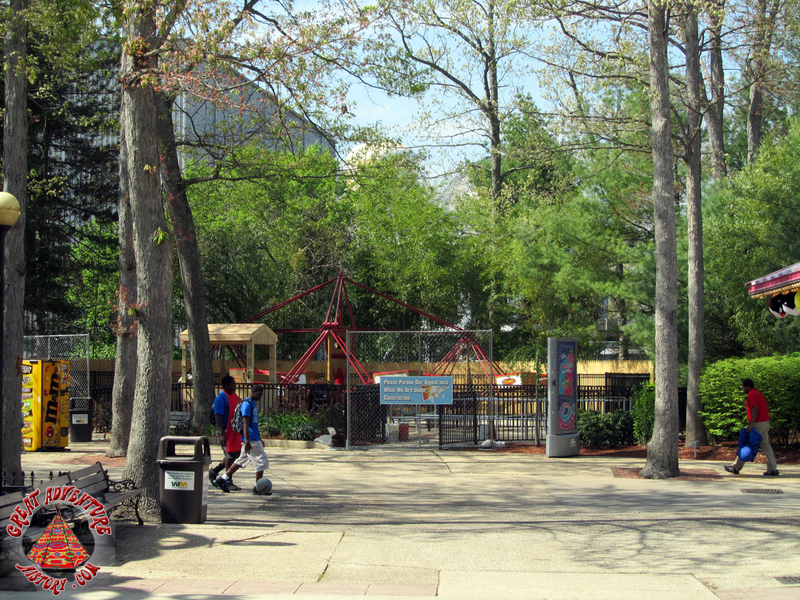 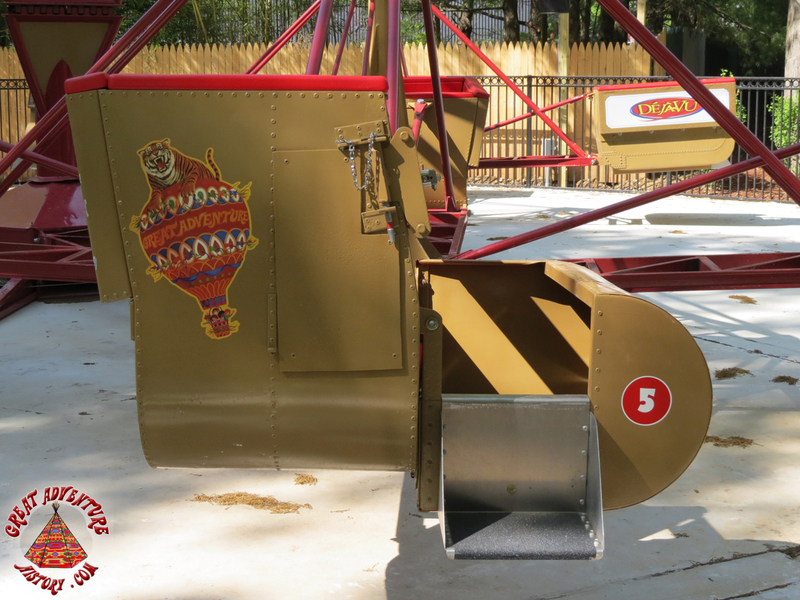 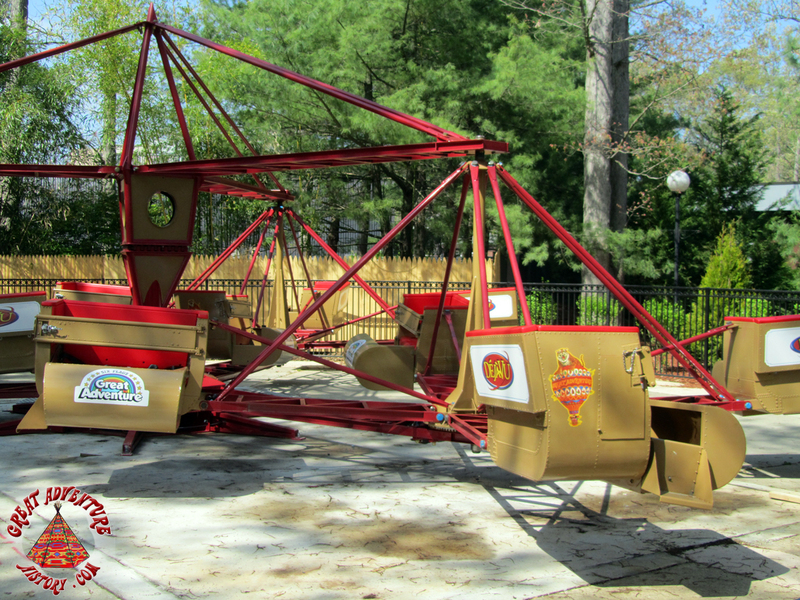 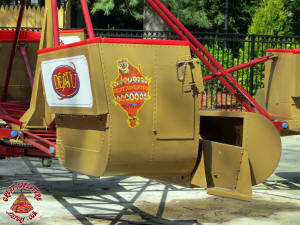 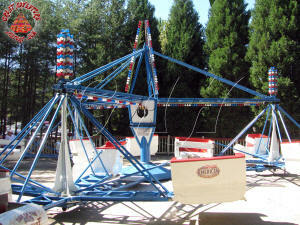 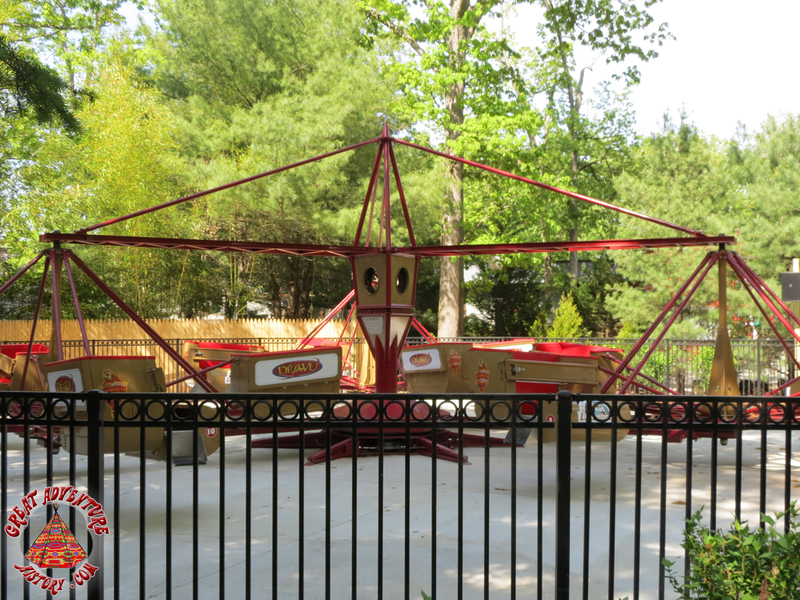 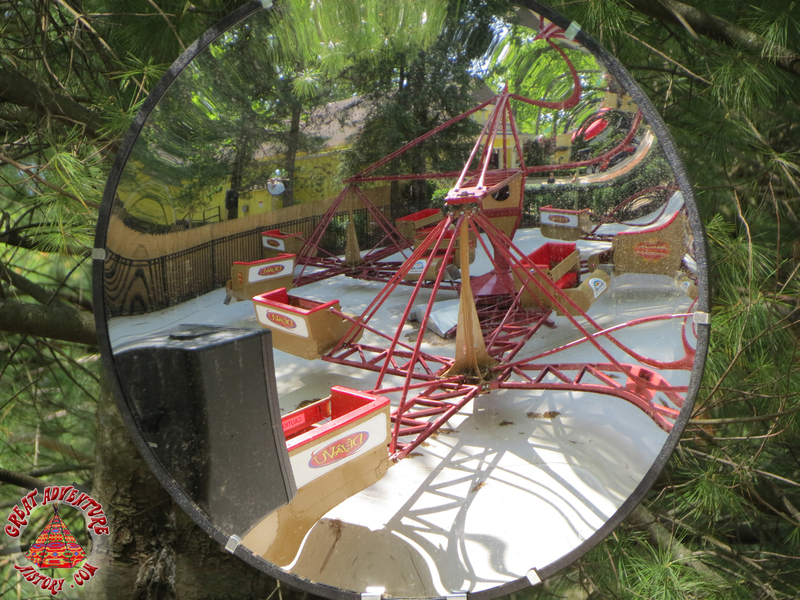 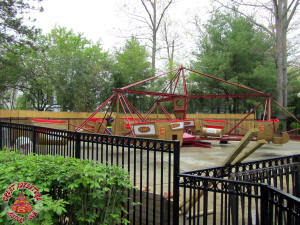 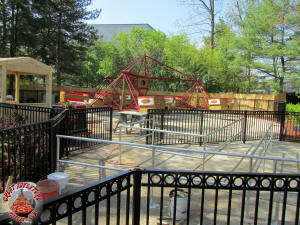 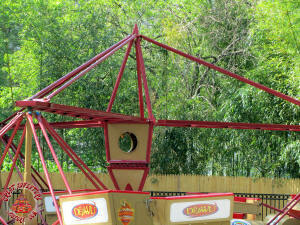 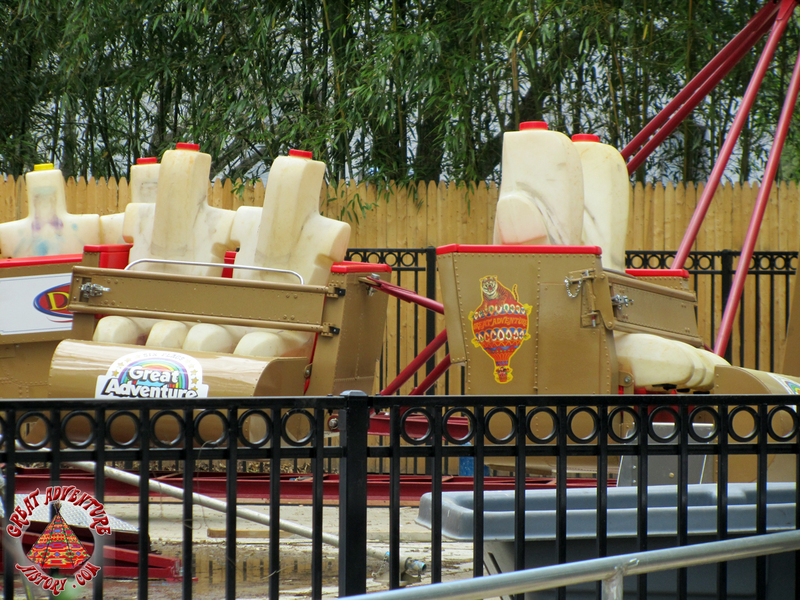 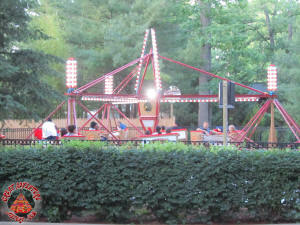 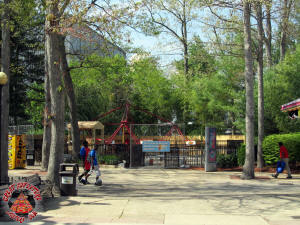 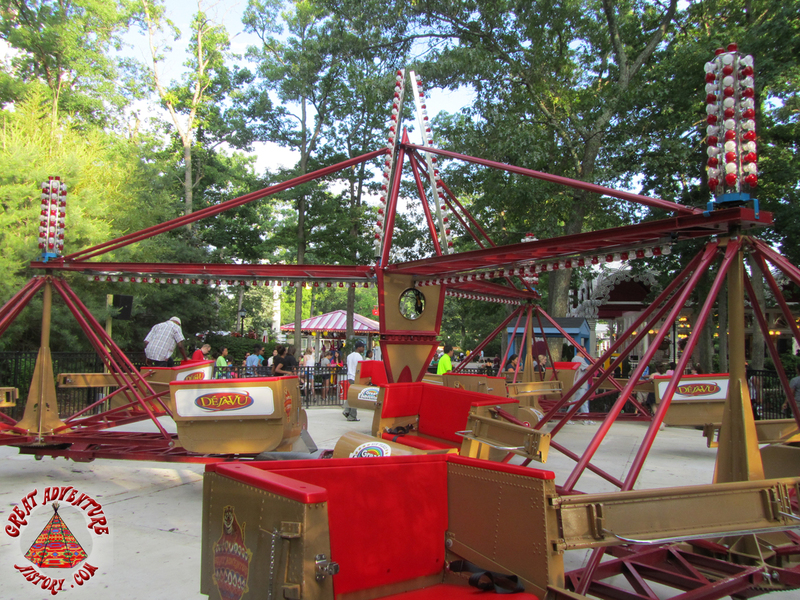 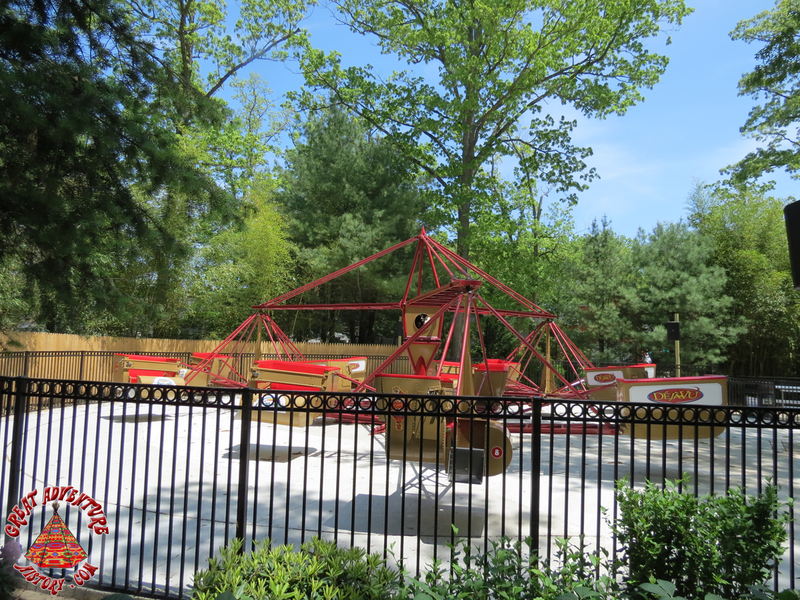 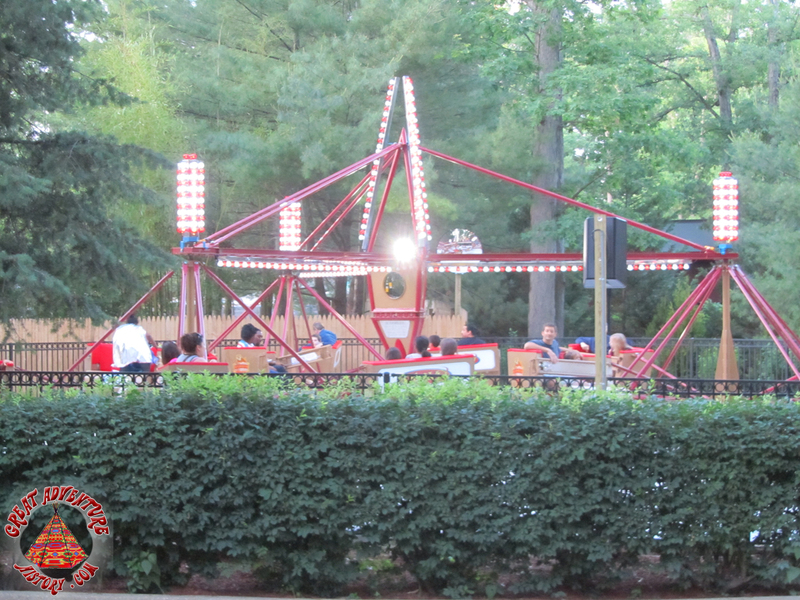 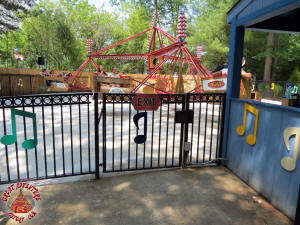 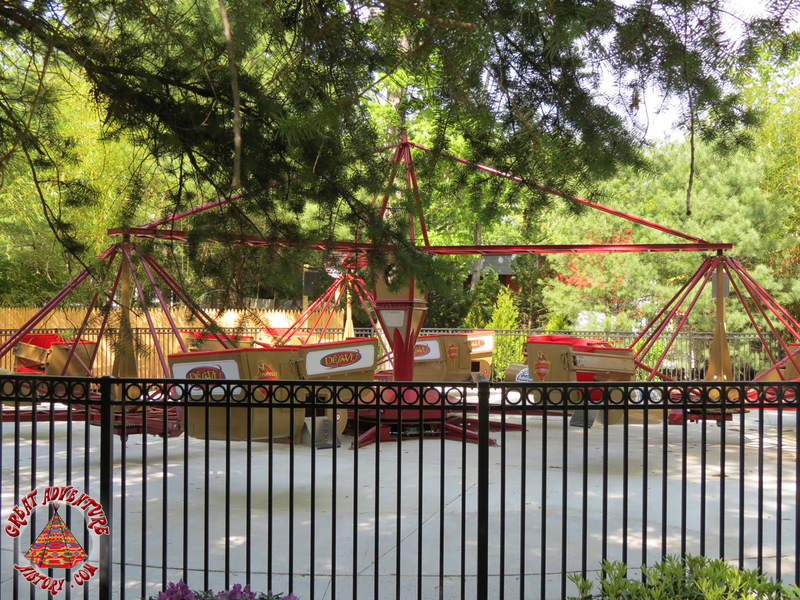 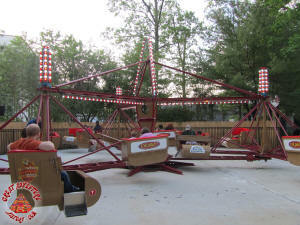 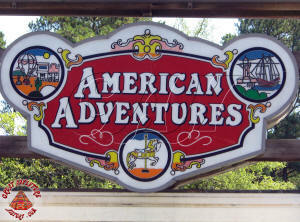 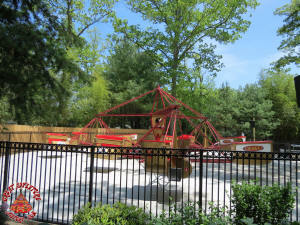 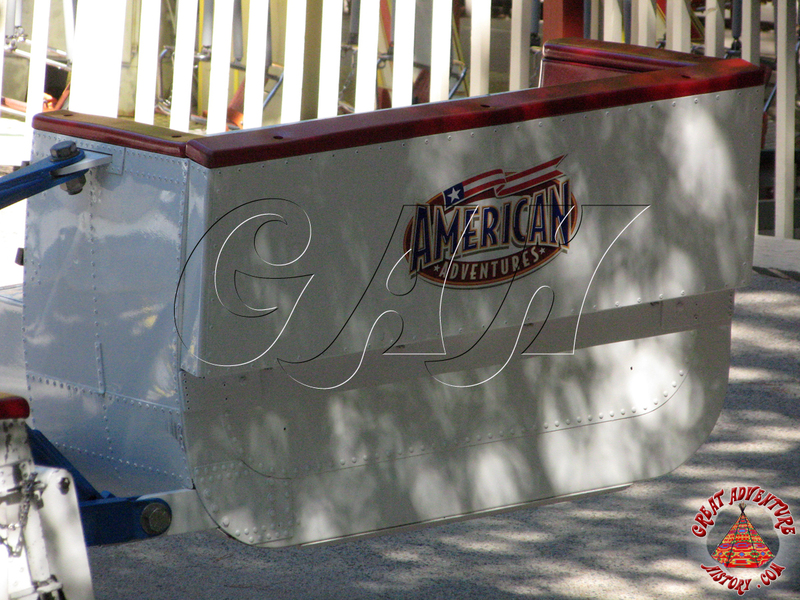 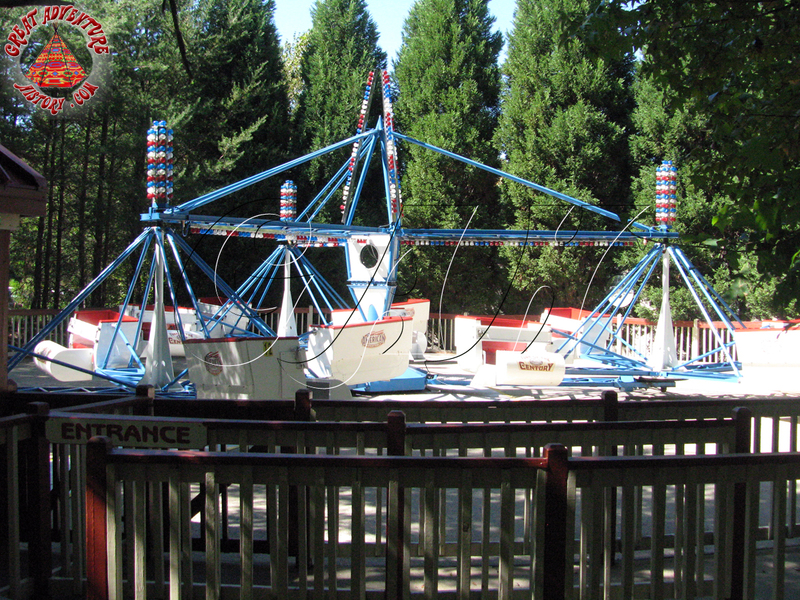 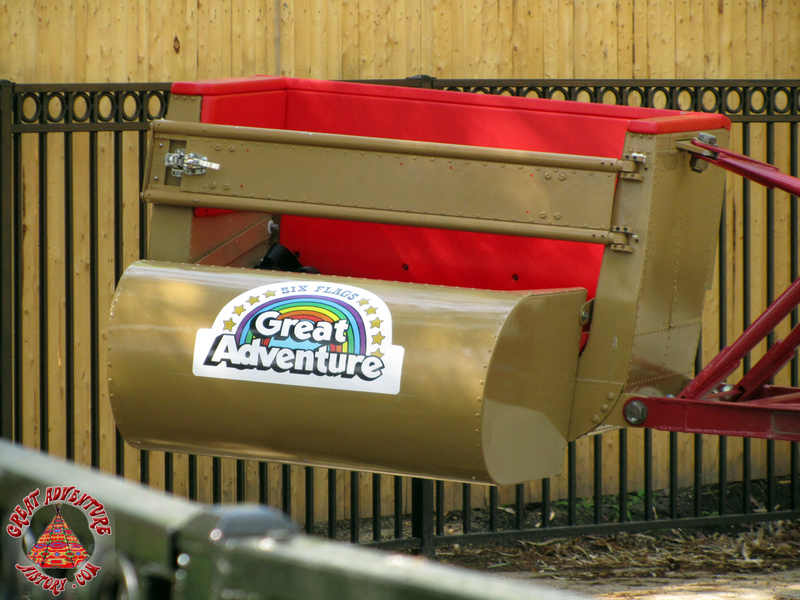 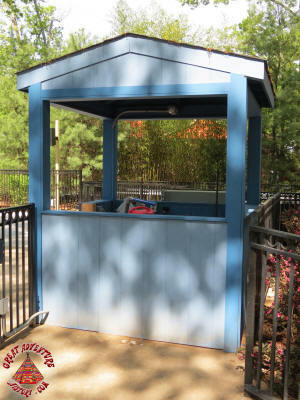 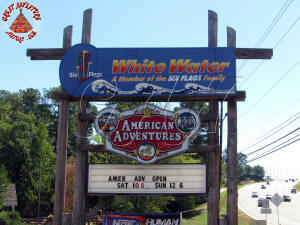 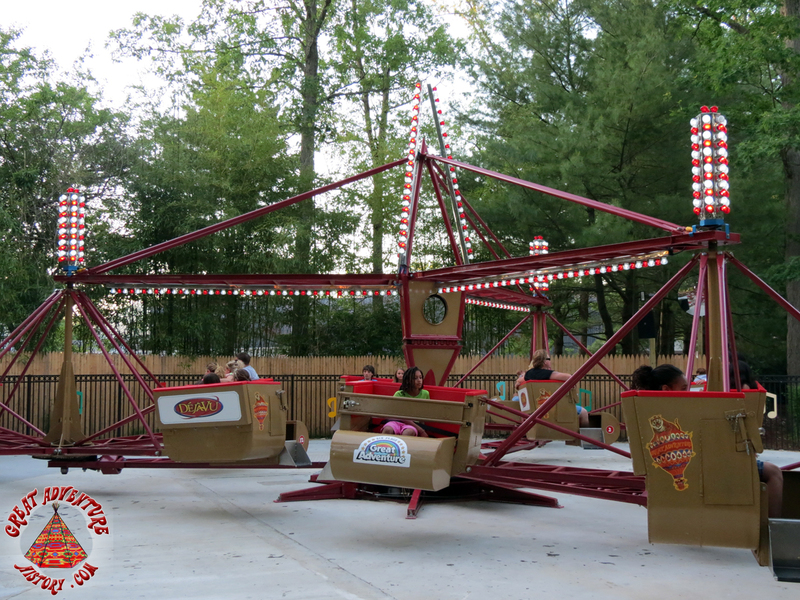 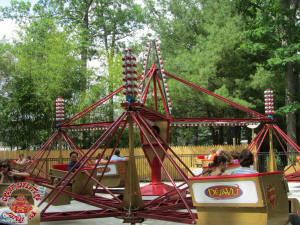 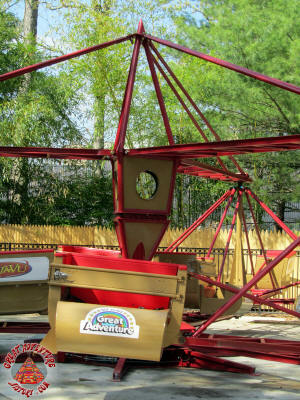 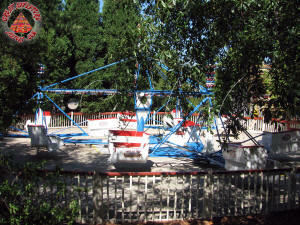 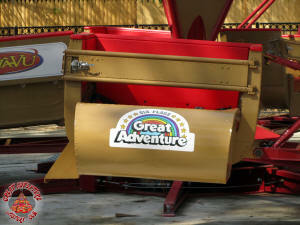 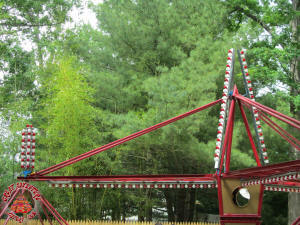 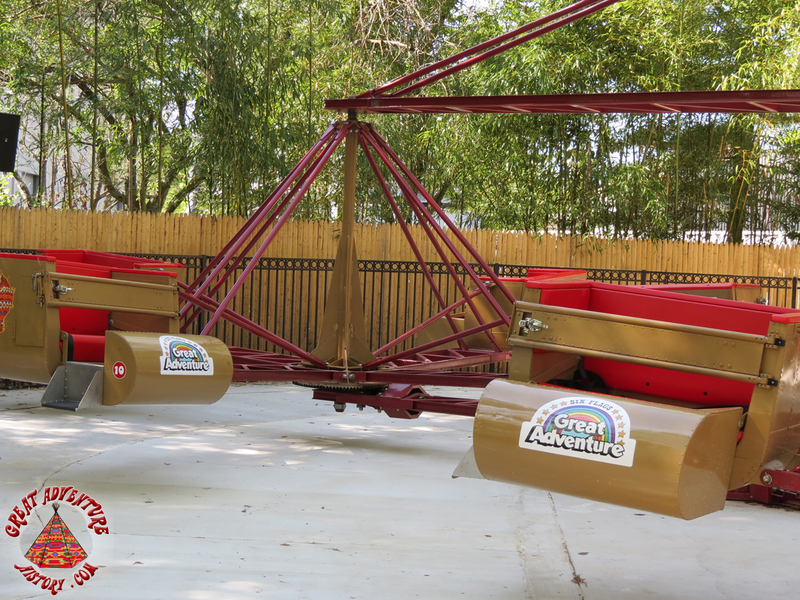 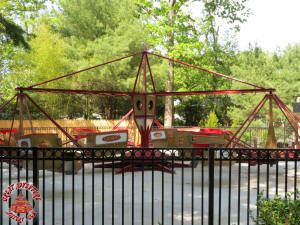 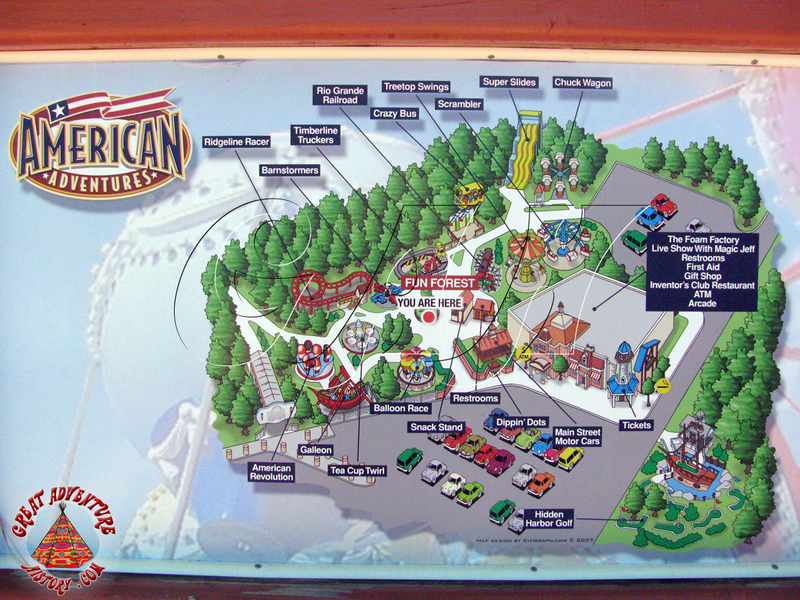 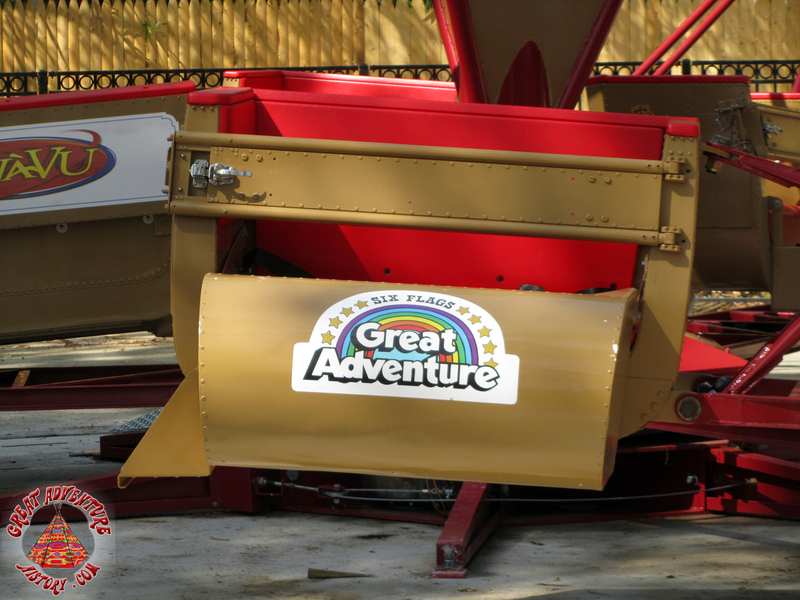 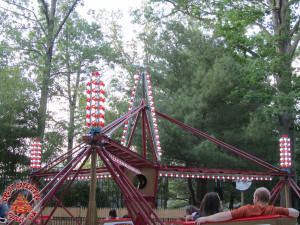 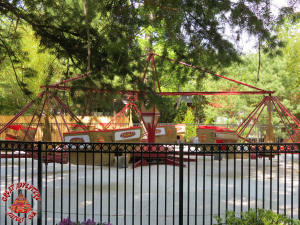 As part of the Six Flags White Water property in Marietta, Georgia, a small family entertainment center called American Adventures operated a few small rides including a Scrambler. 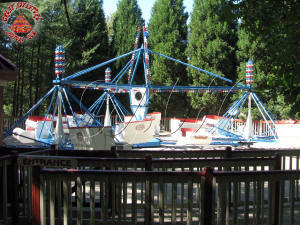 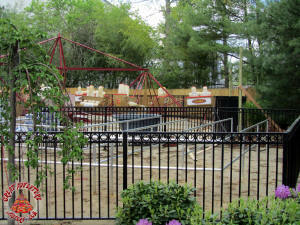 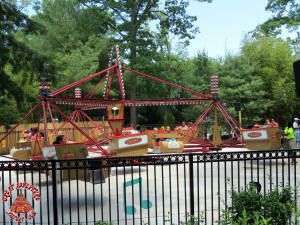 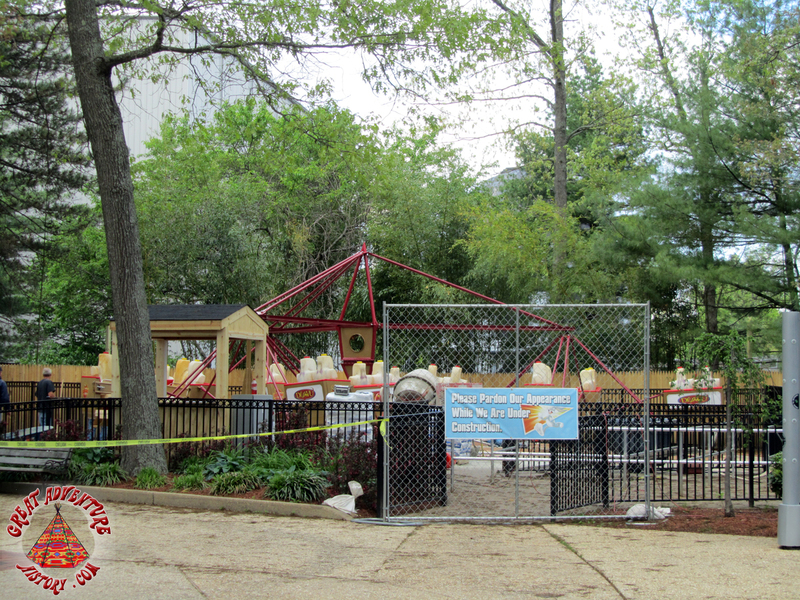 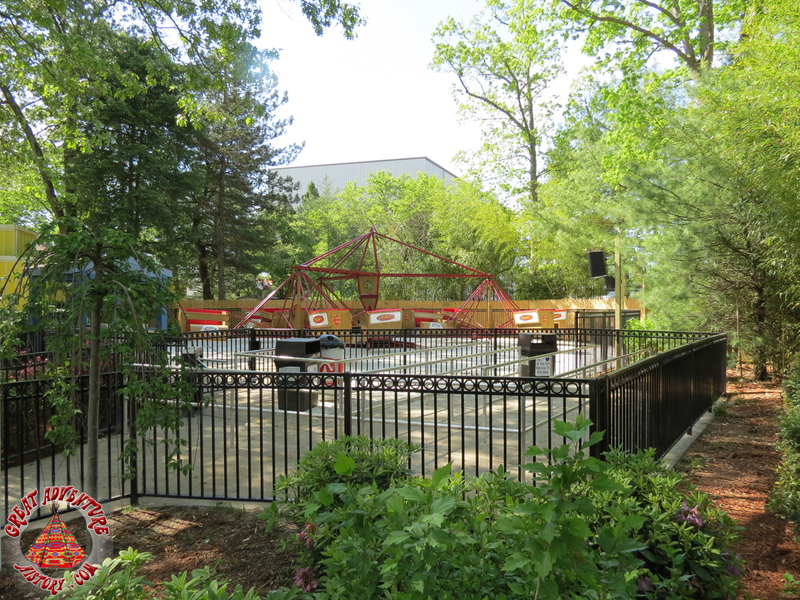 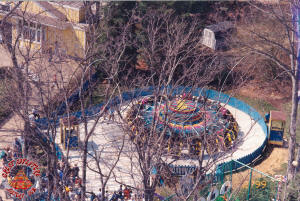 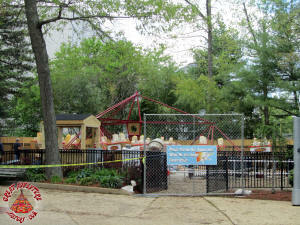 When the park closed, the rides sat idle until decisions were made to relocate them. 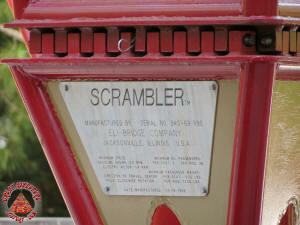 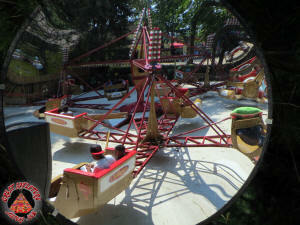 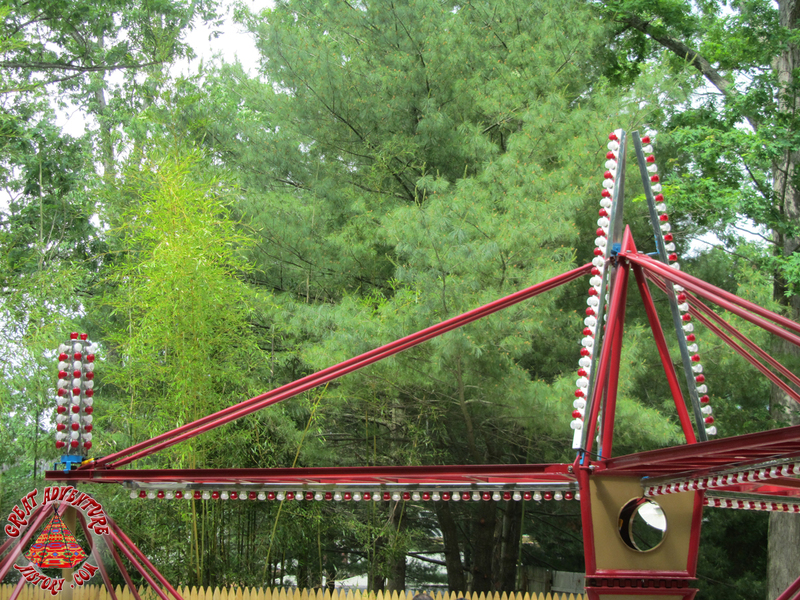 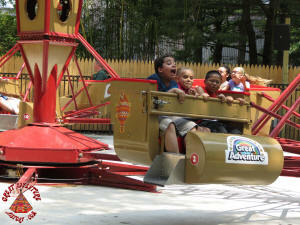 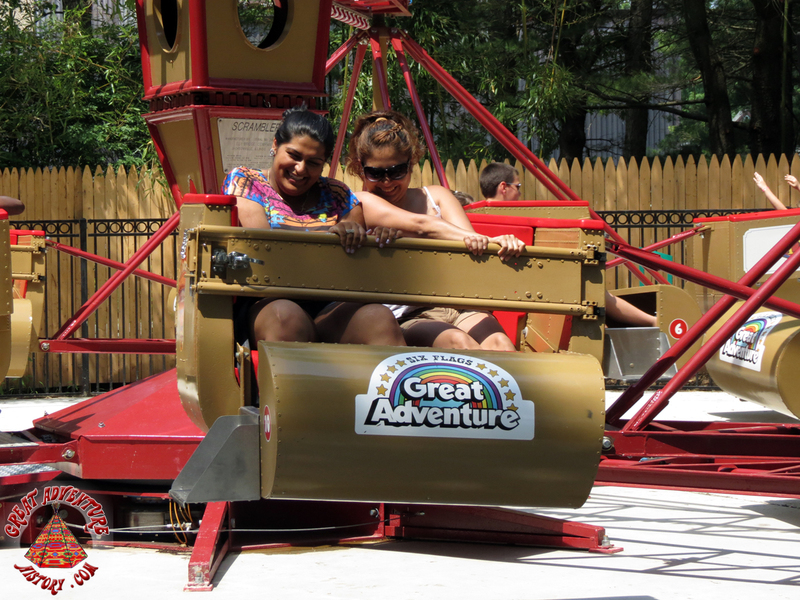 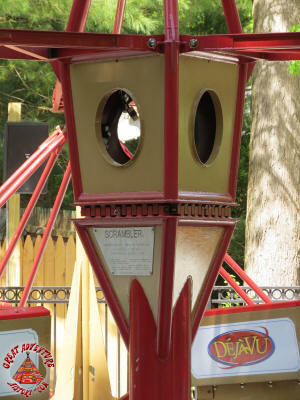 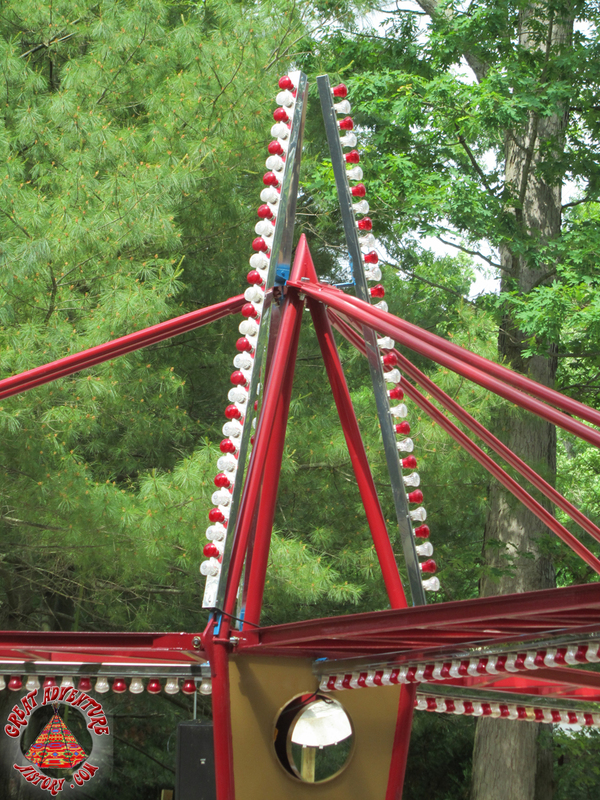 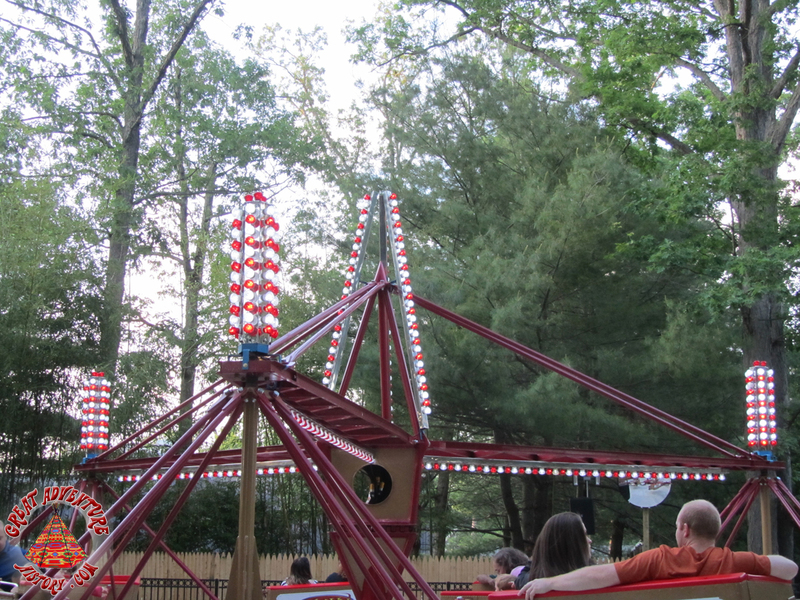 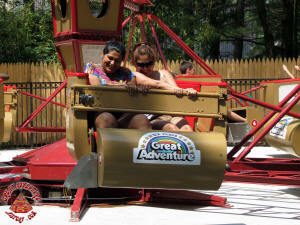 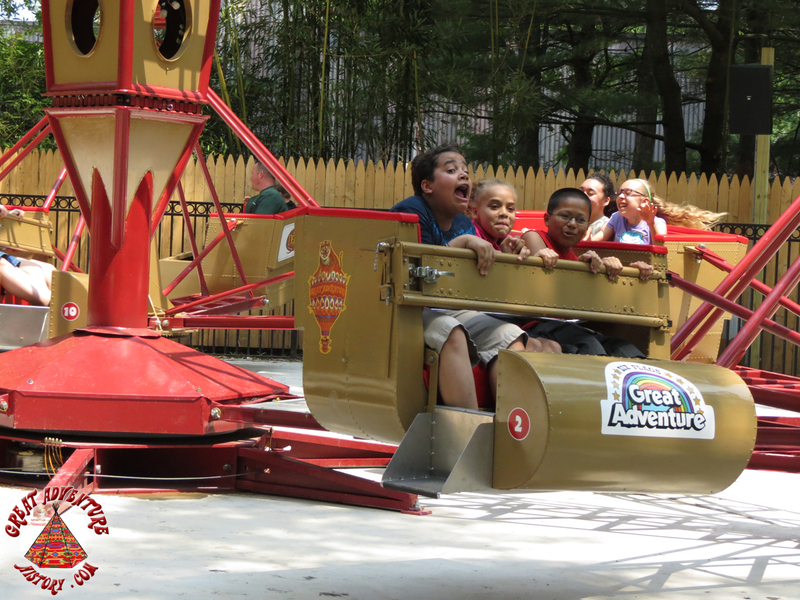 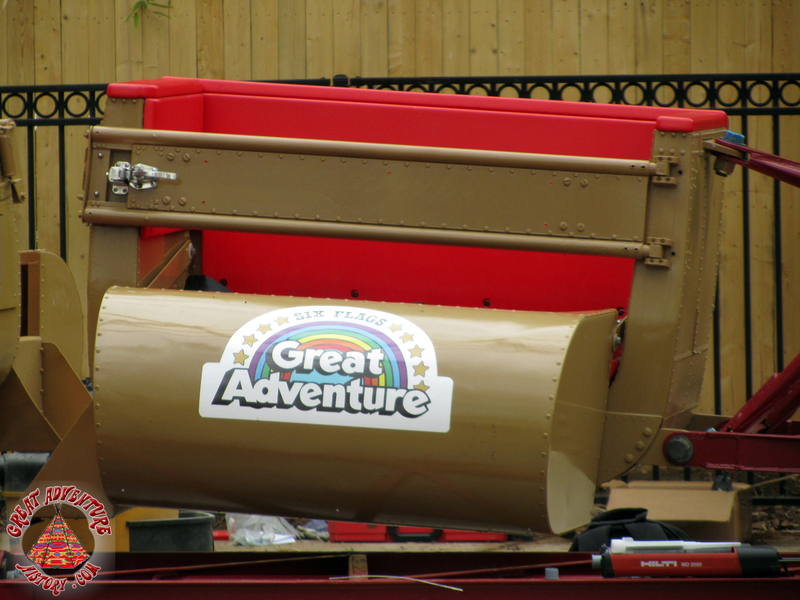 The Scrambler was brought to Great Adventure to become Deja Vu. 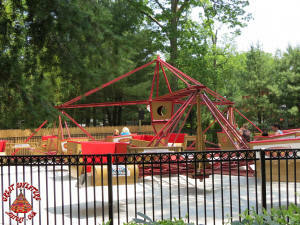 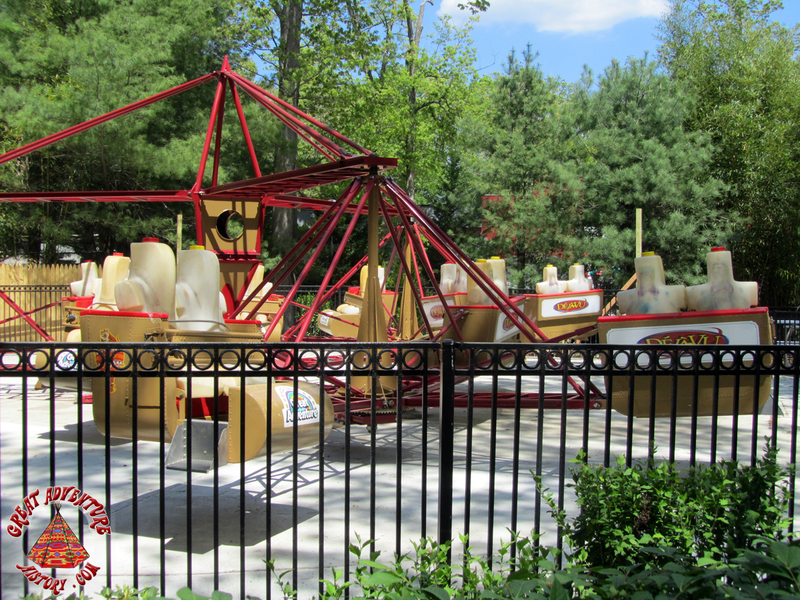 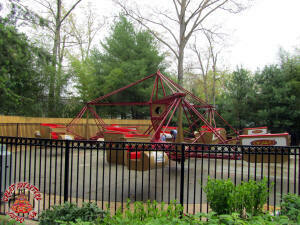 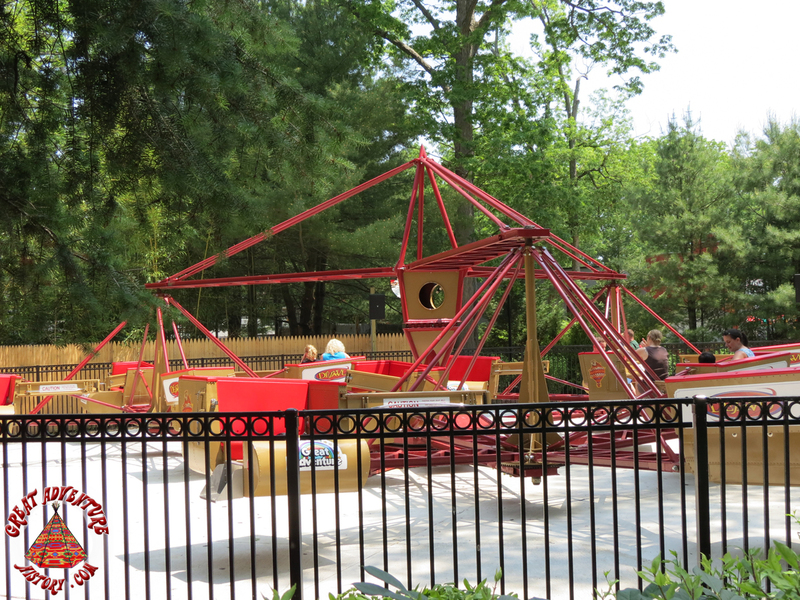 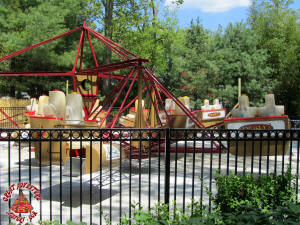 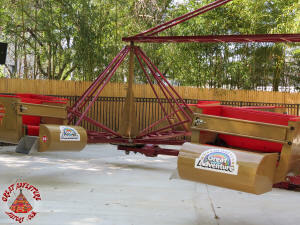 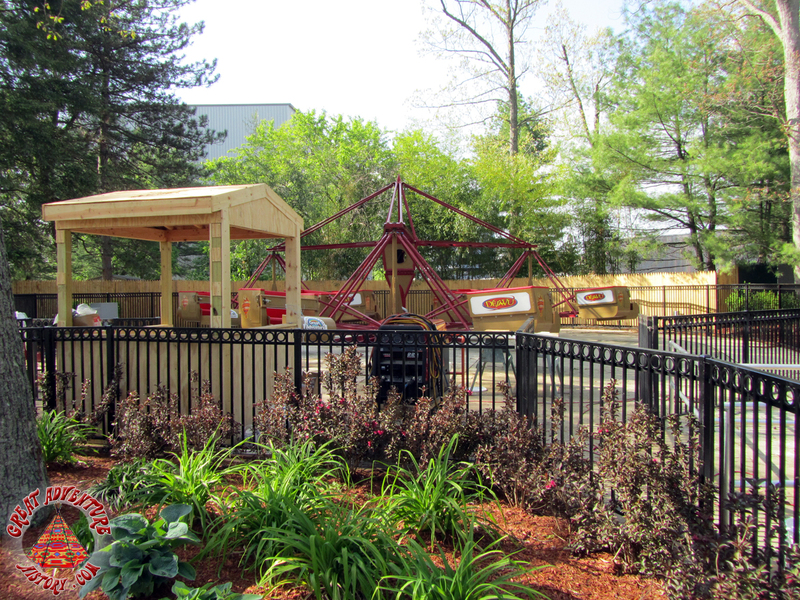 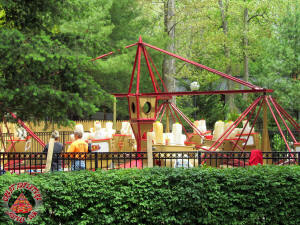 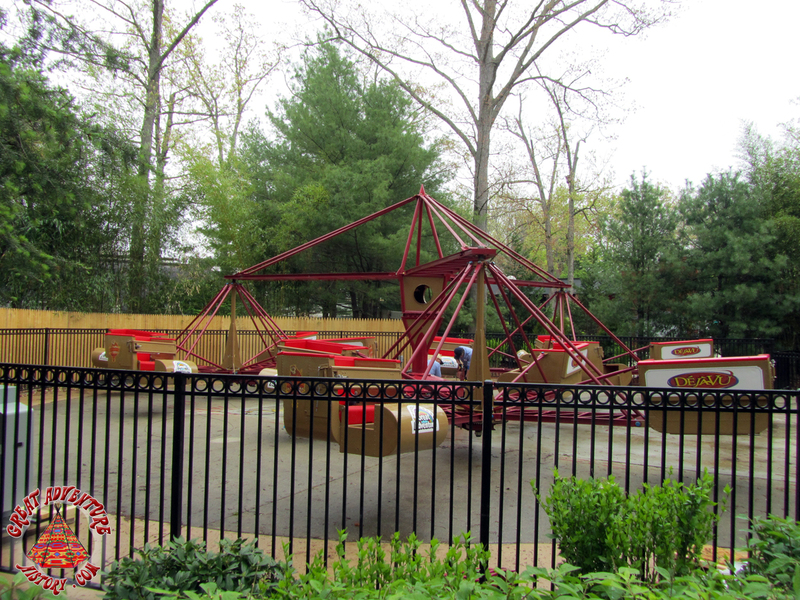 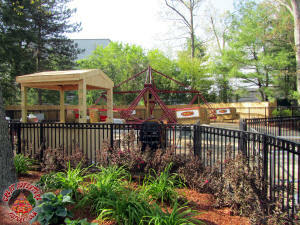 For the 2012 season the park introduced several new classic flat rides that had been long missing from the ride lineup, adding them all as part of the new Adventure Alley area. 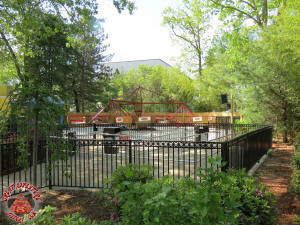 This update of the Big Wheel end of Dream Street was much needed, with many rides having been removed over the years leaving several empty ride pads. 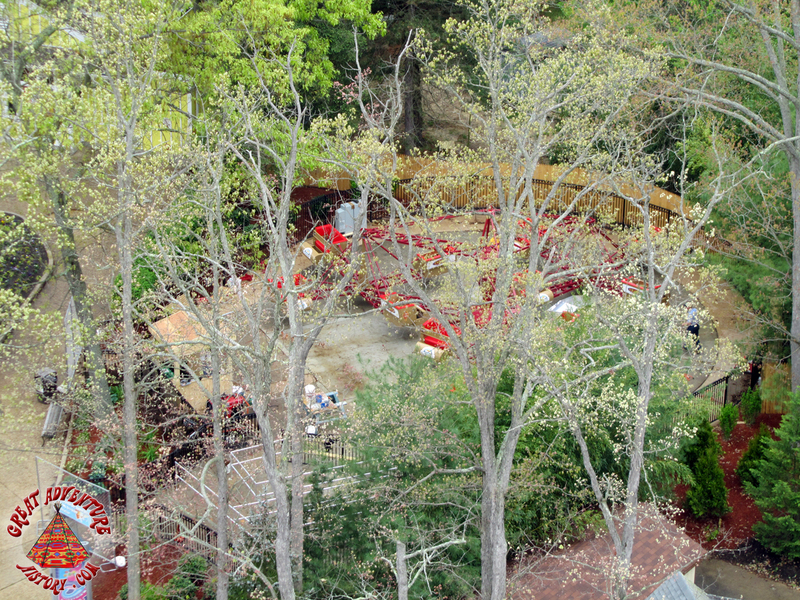 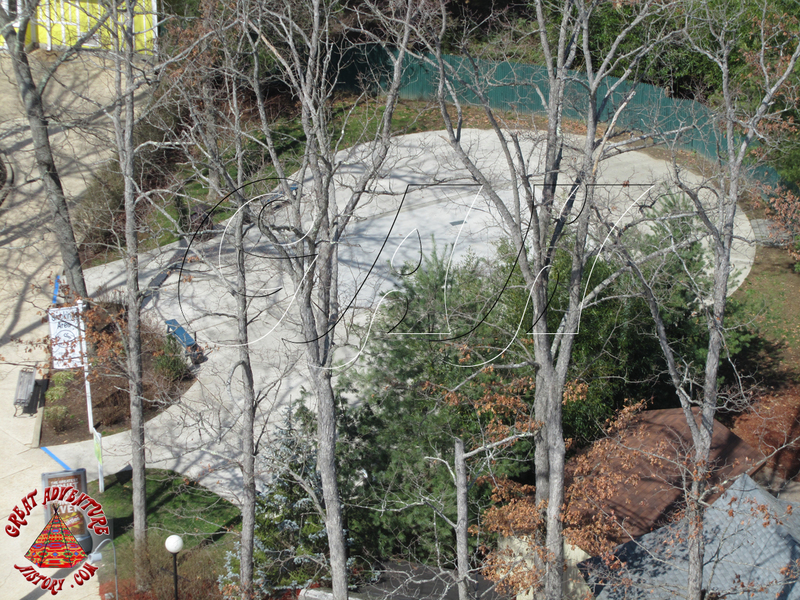 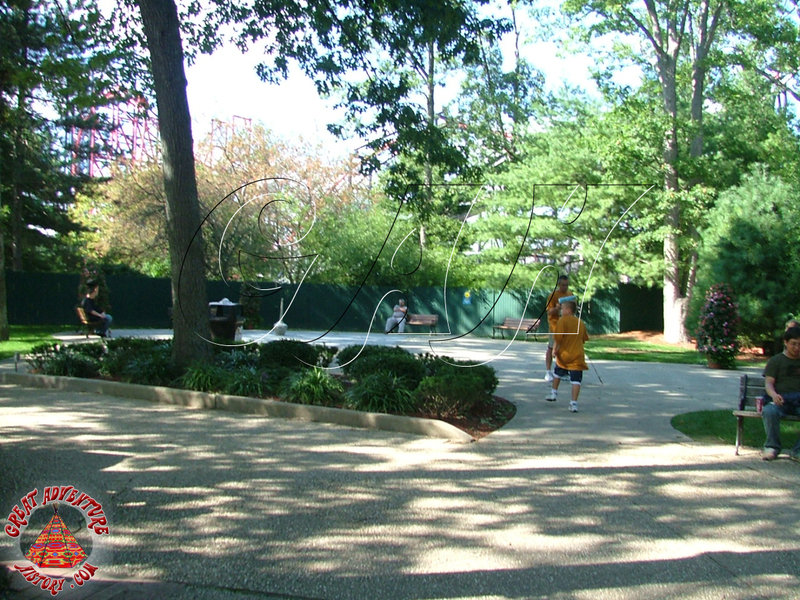 The Chaos pad had been vacant for several seasons, and its out of the way location was the ideal spot for one of the park's smoking areas. 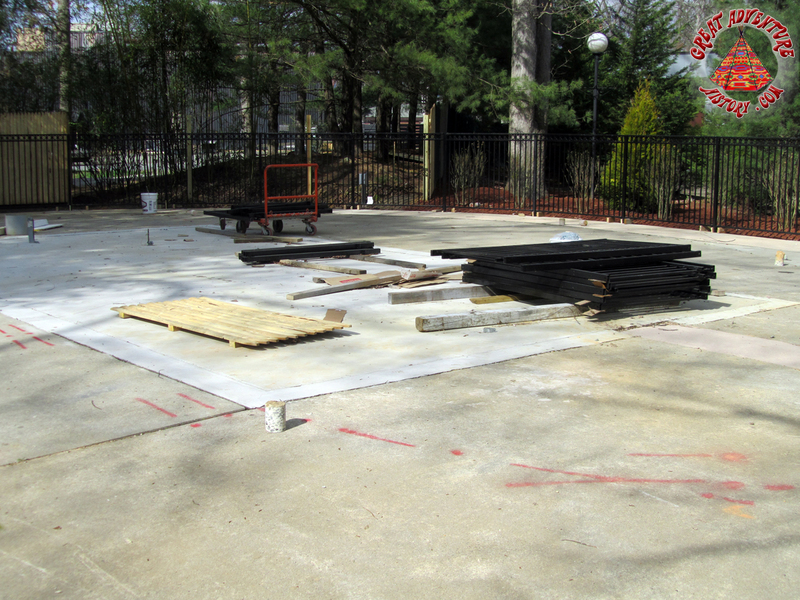 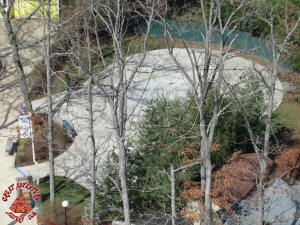 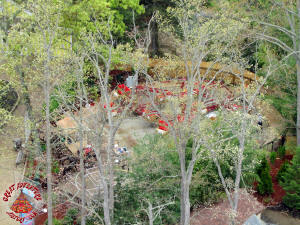 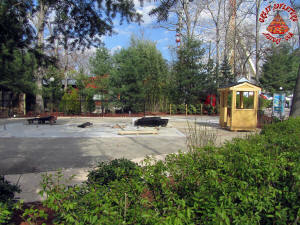 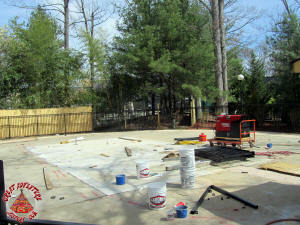 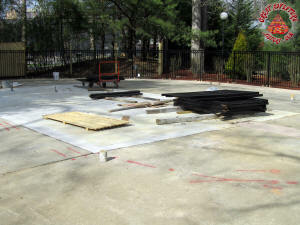 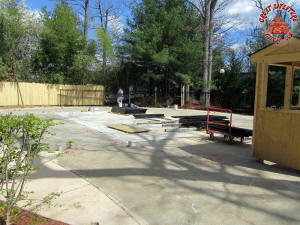 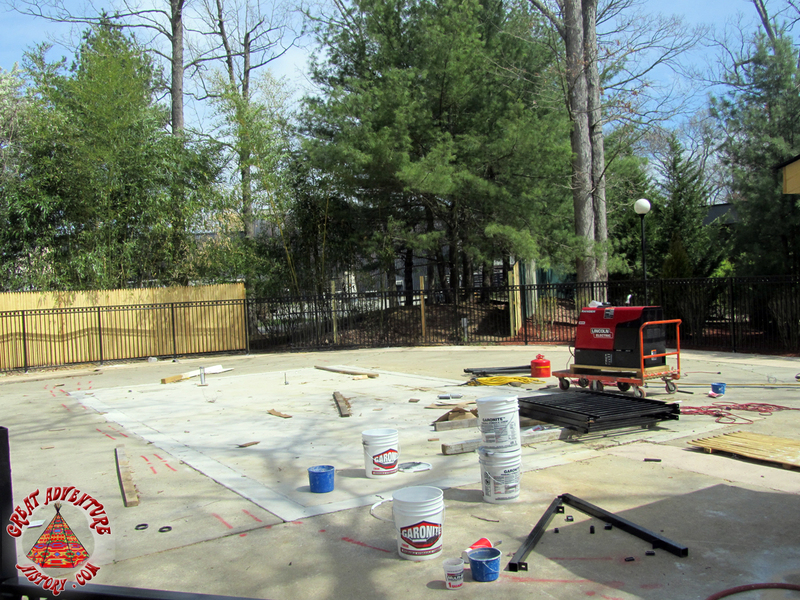 In the spring of 2012, preparation of the former Chaos pad began for the installation of Deja Vu. 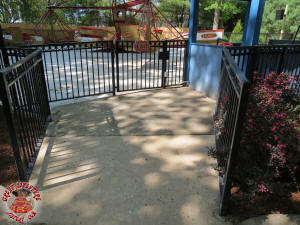 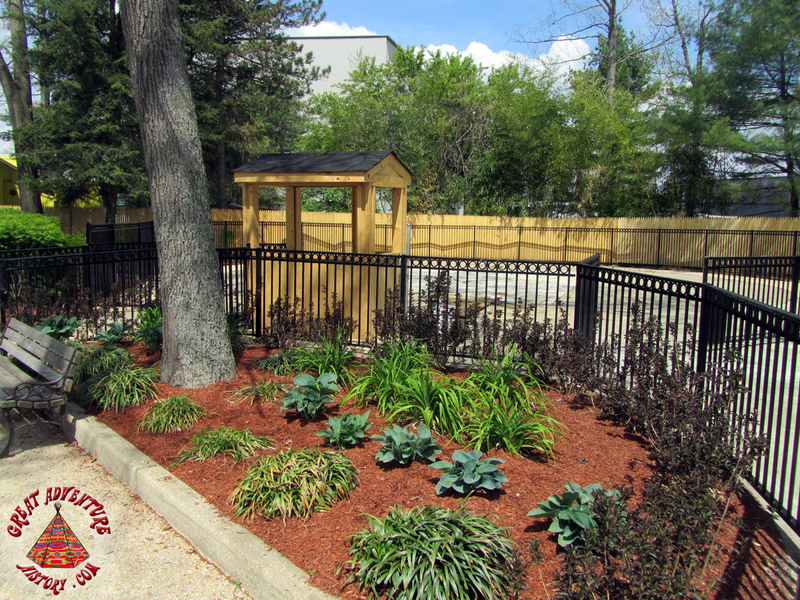 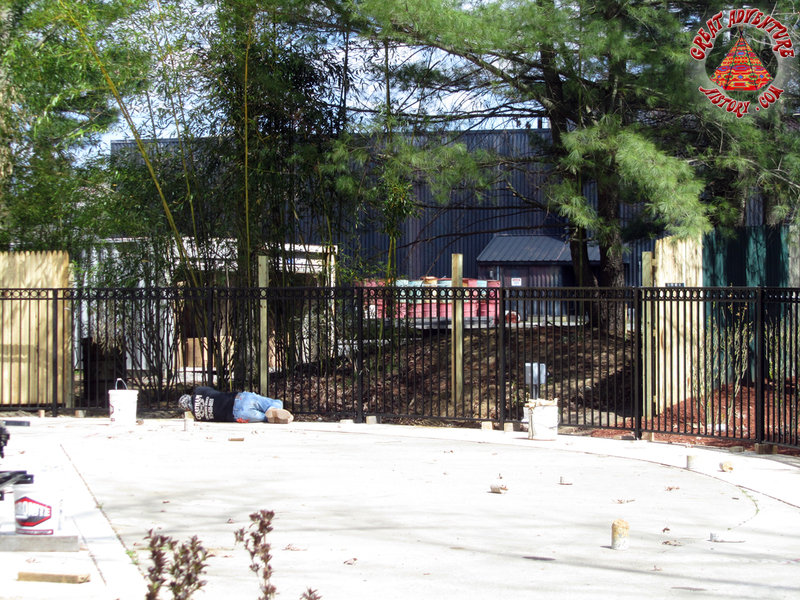 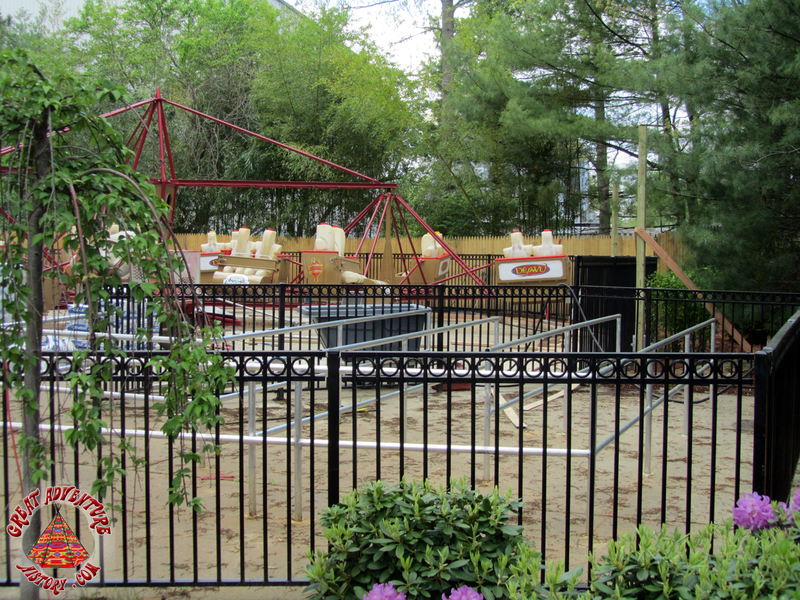 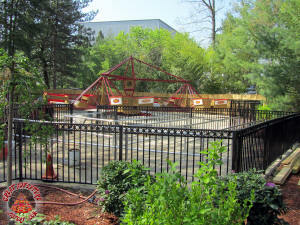 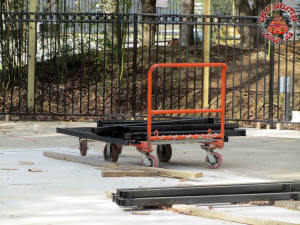 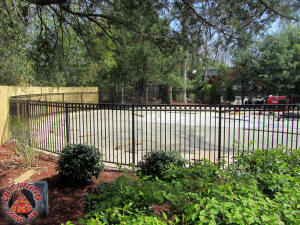 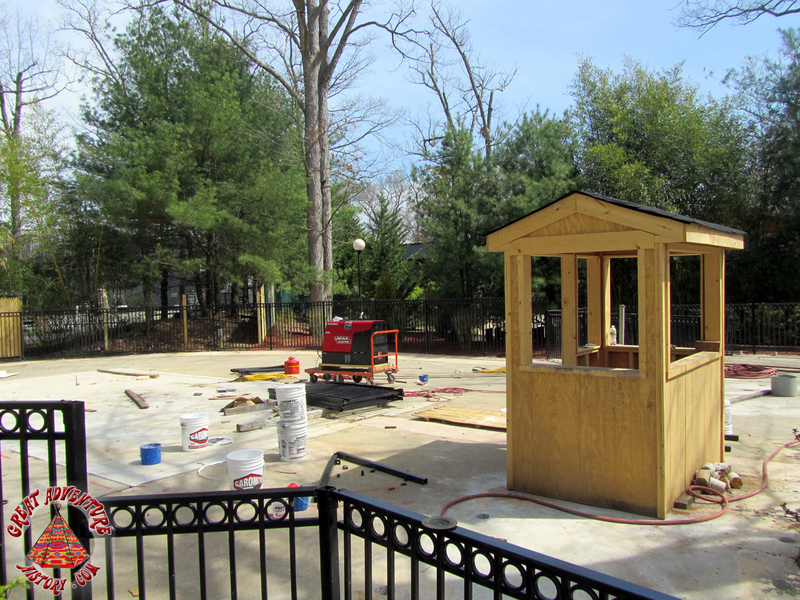 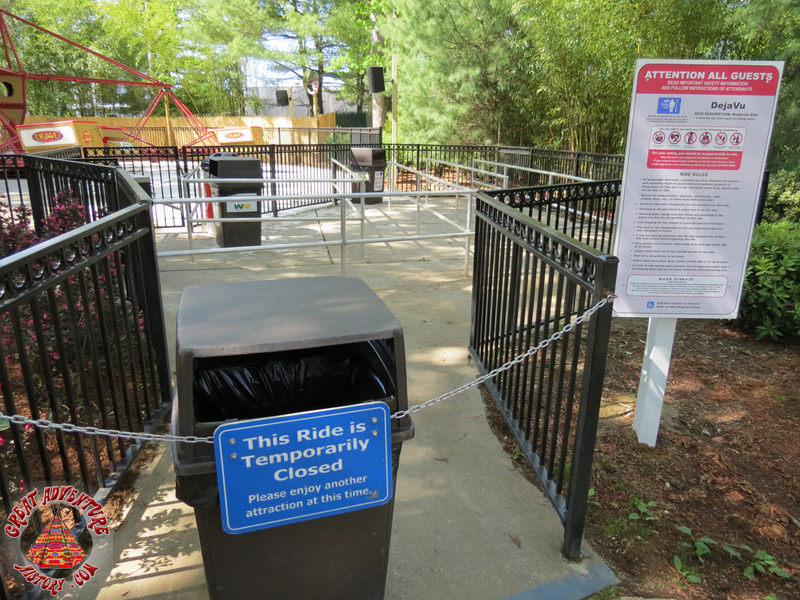 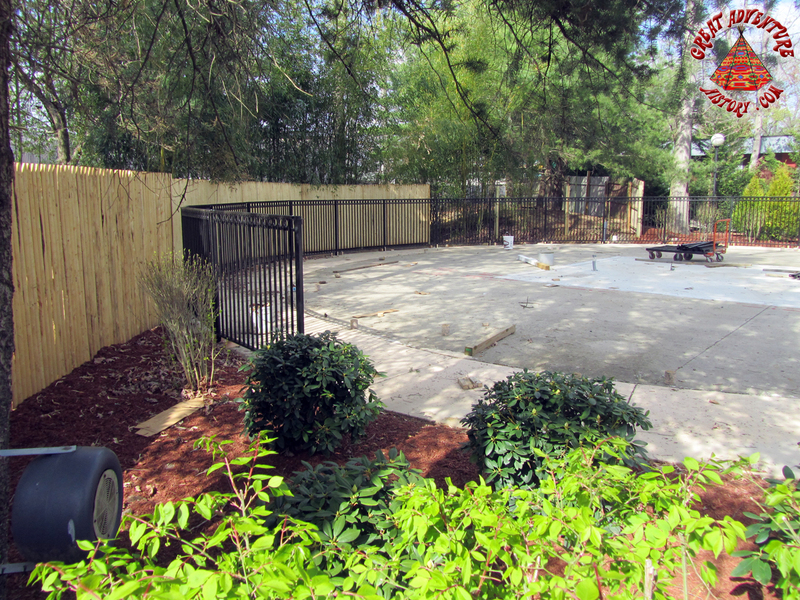 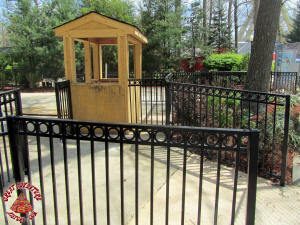 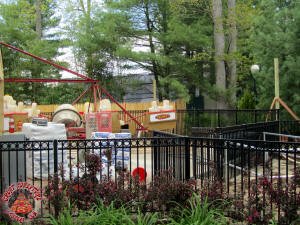 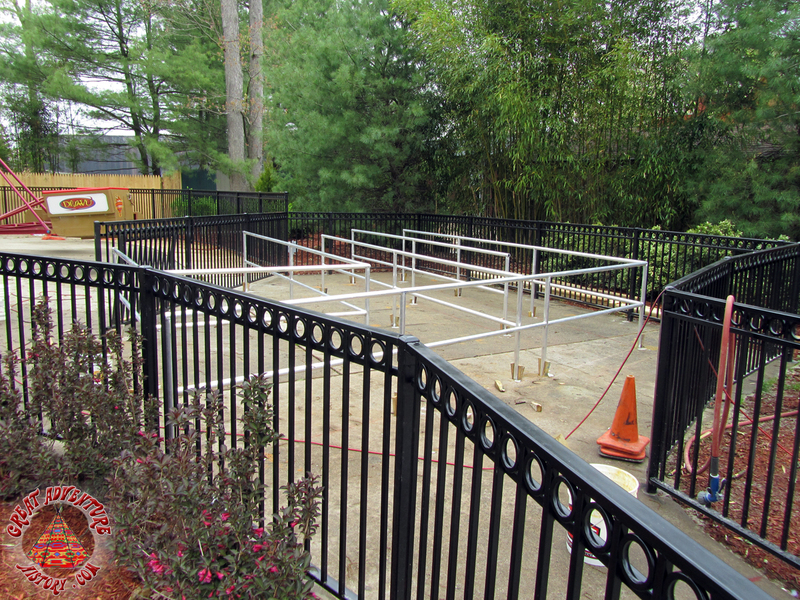 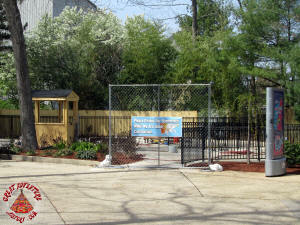 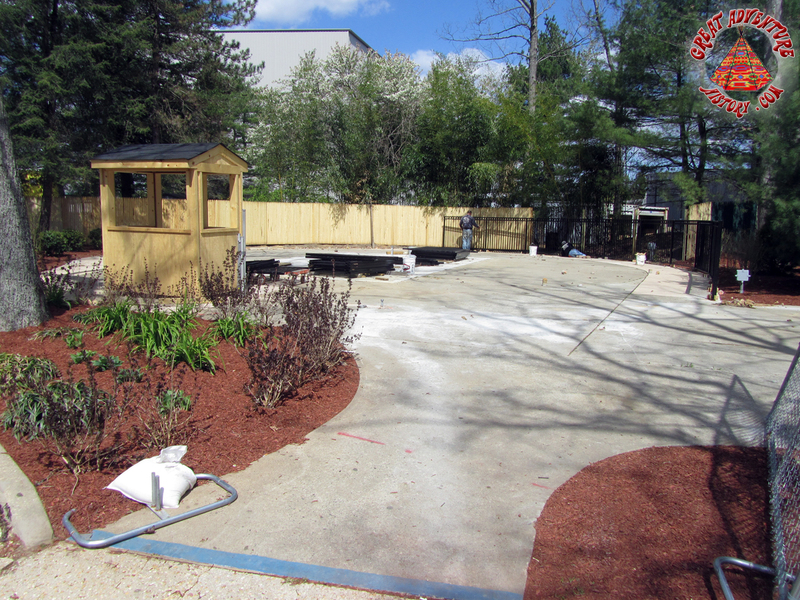 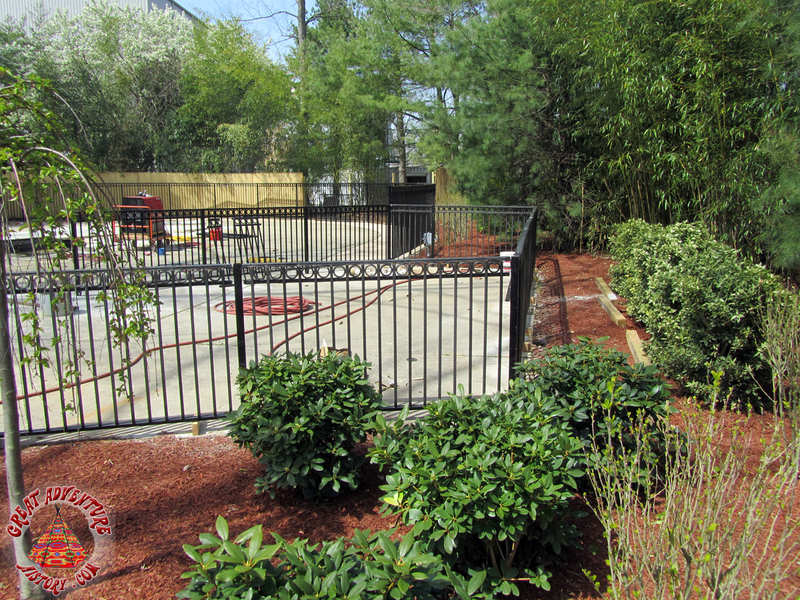 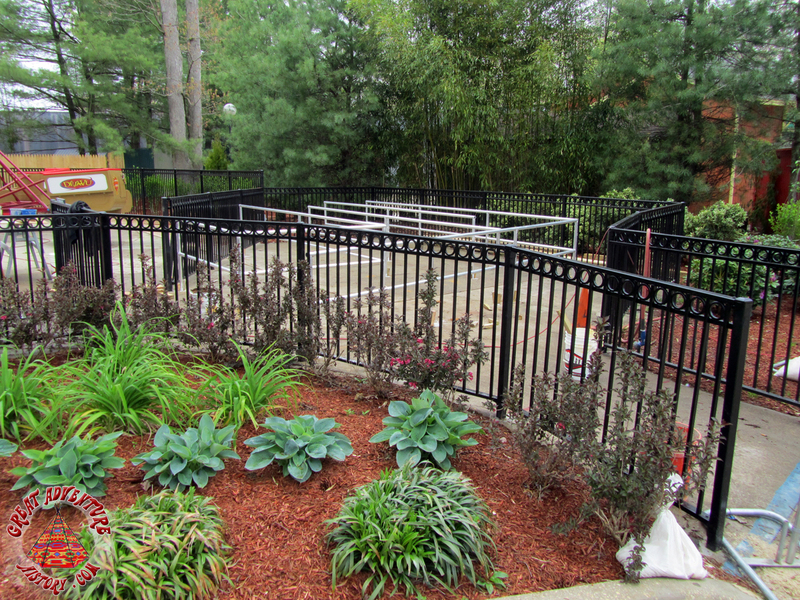 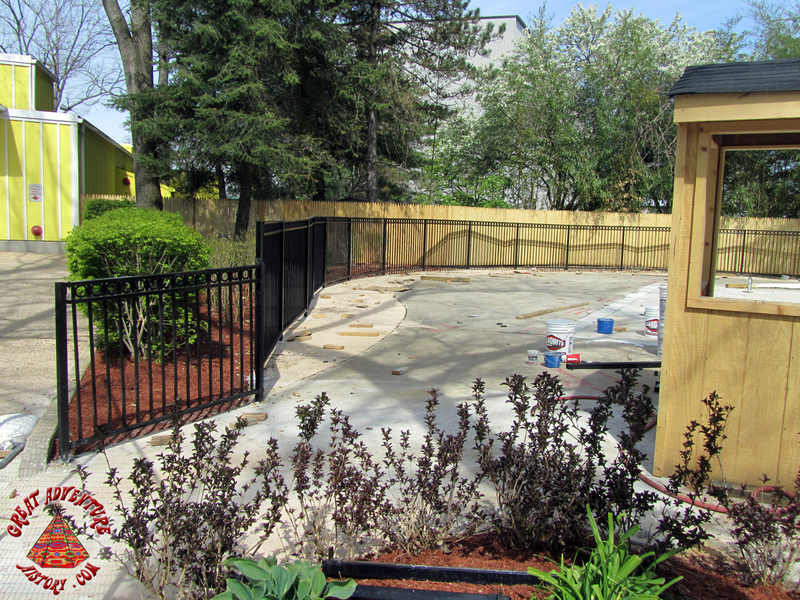 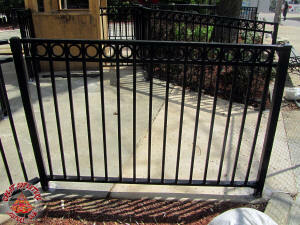 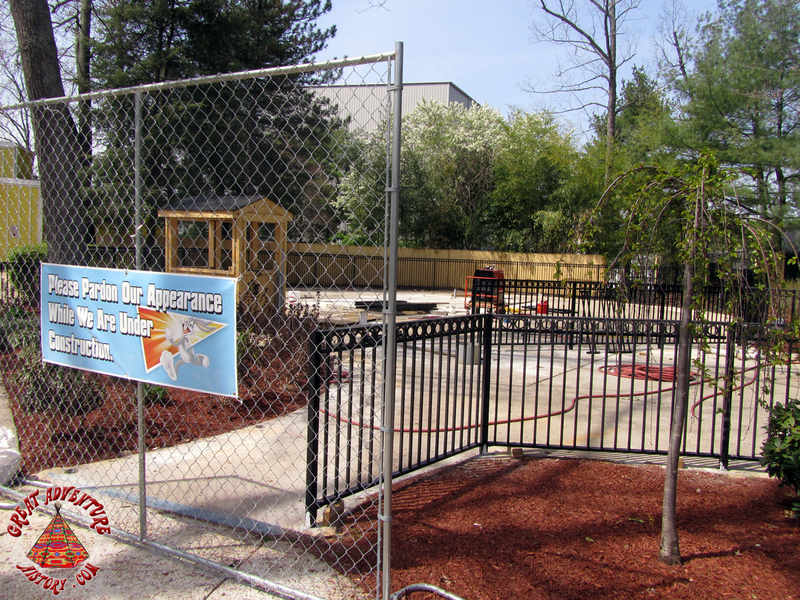 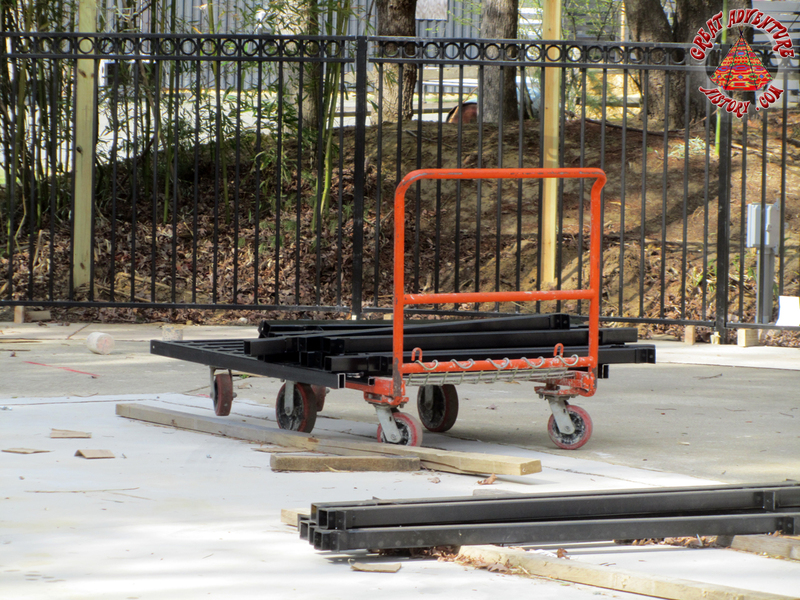 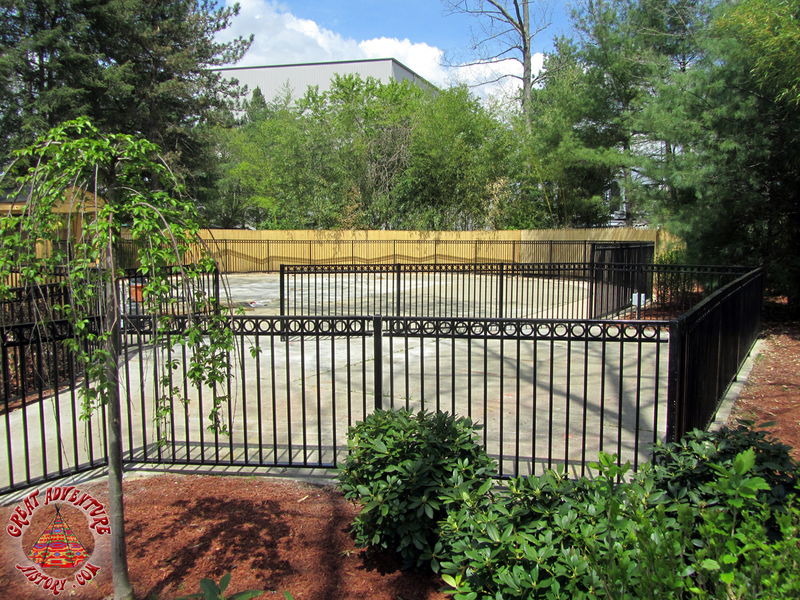 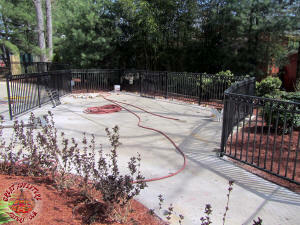 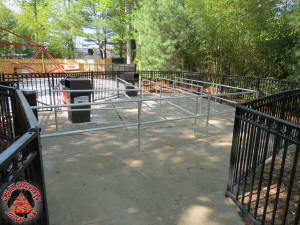 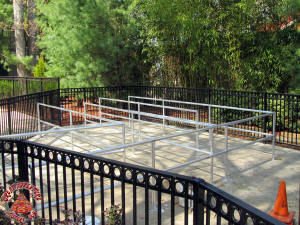 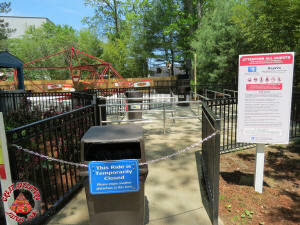 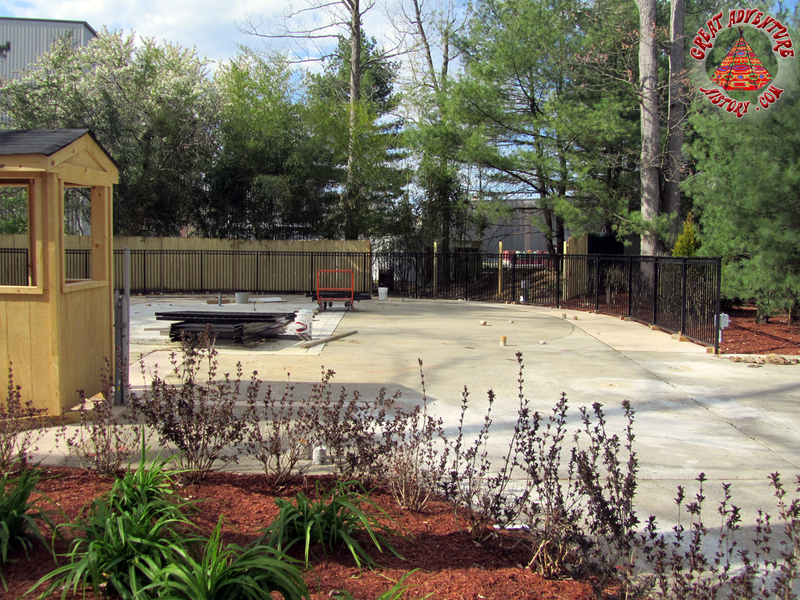 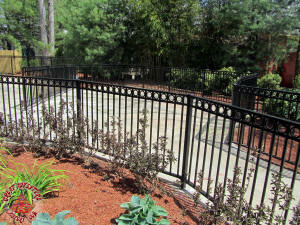 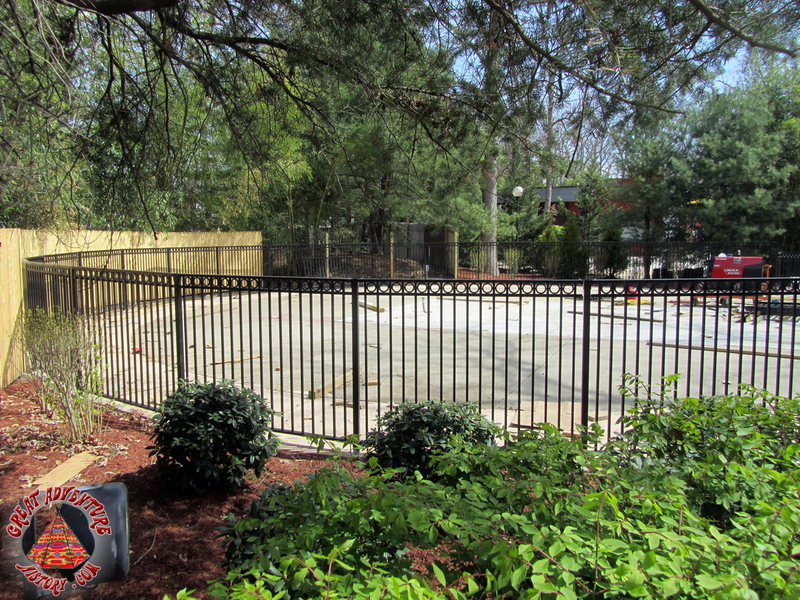 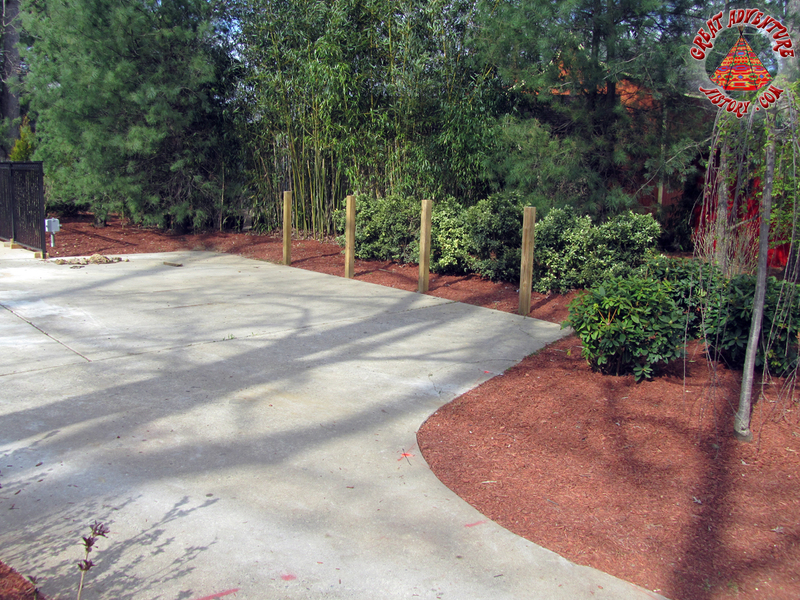 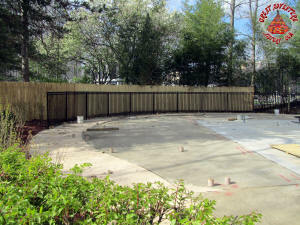 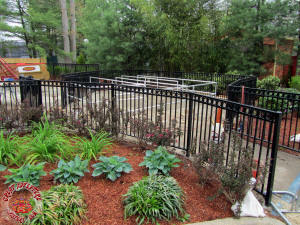 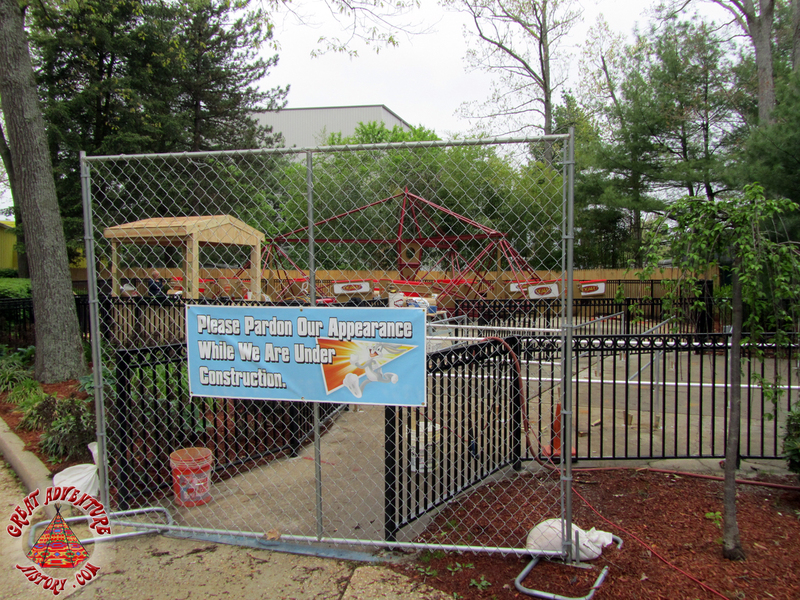 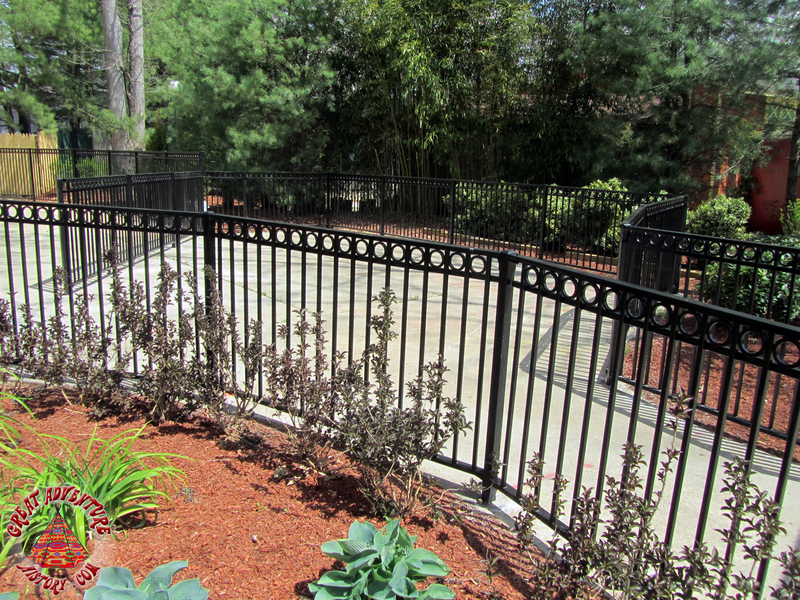 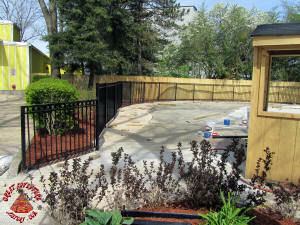 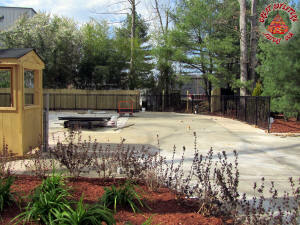 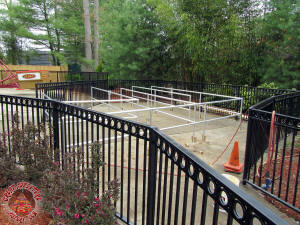 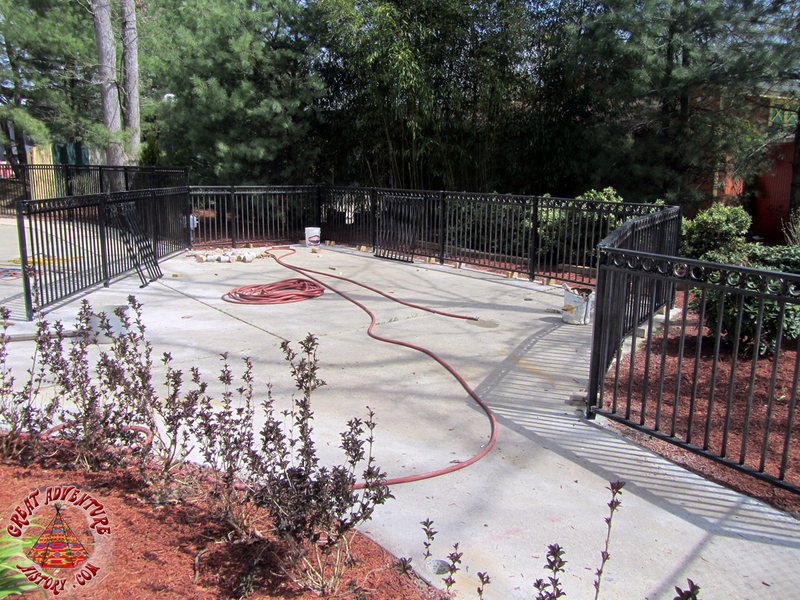 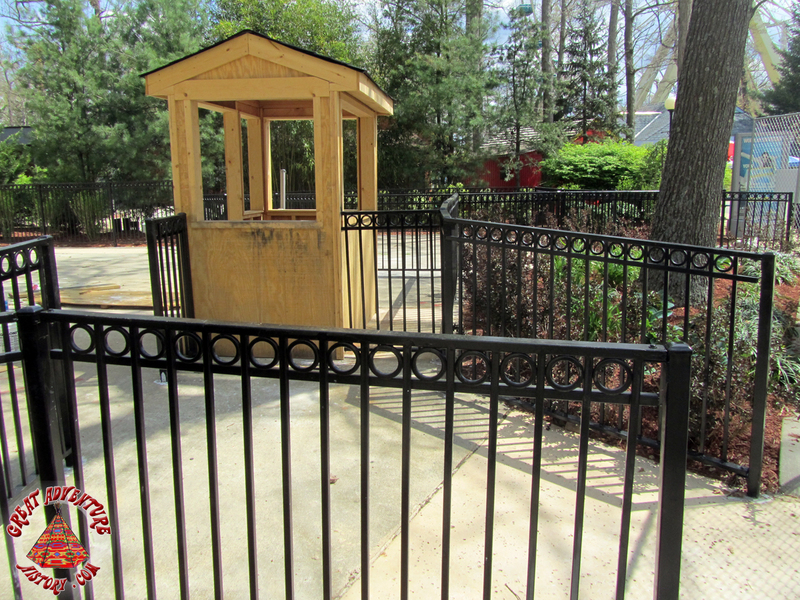 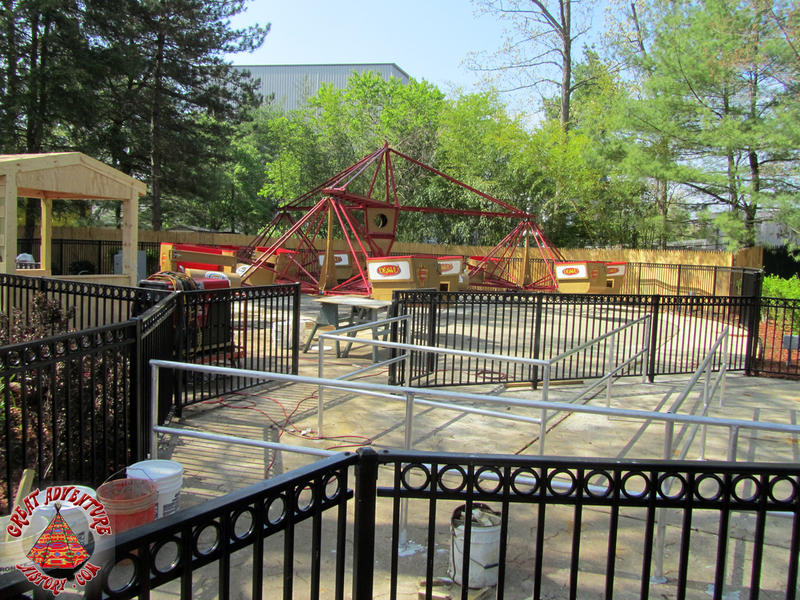 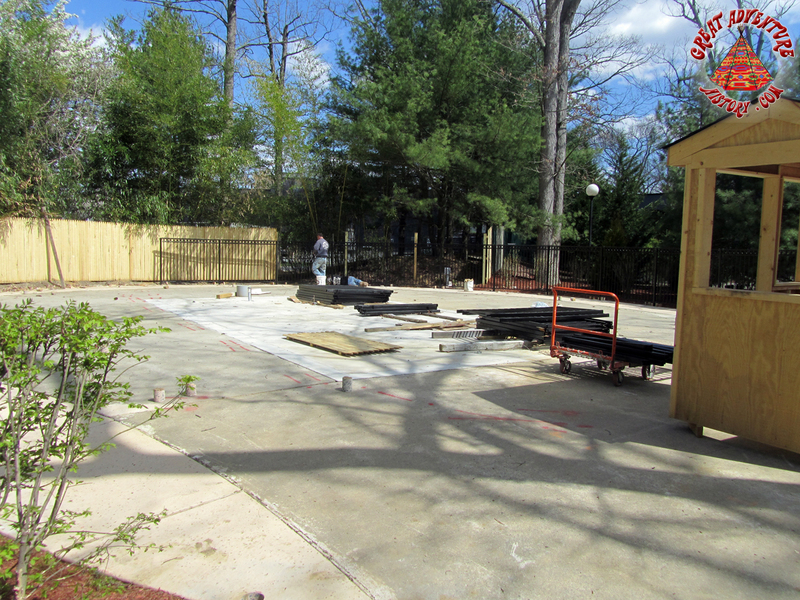 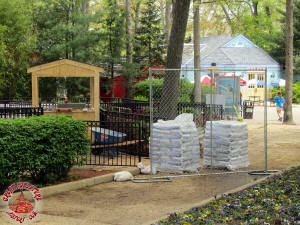 A new iron fence was built around the perimeter and new concrete was poured for the expanded queue area. 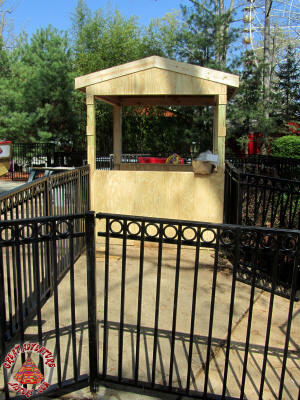 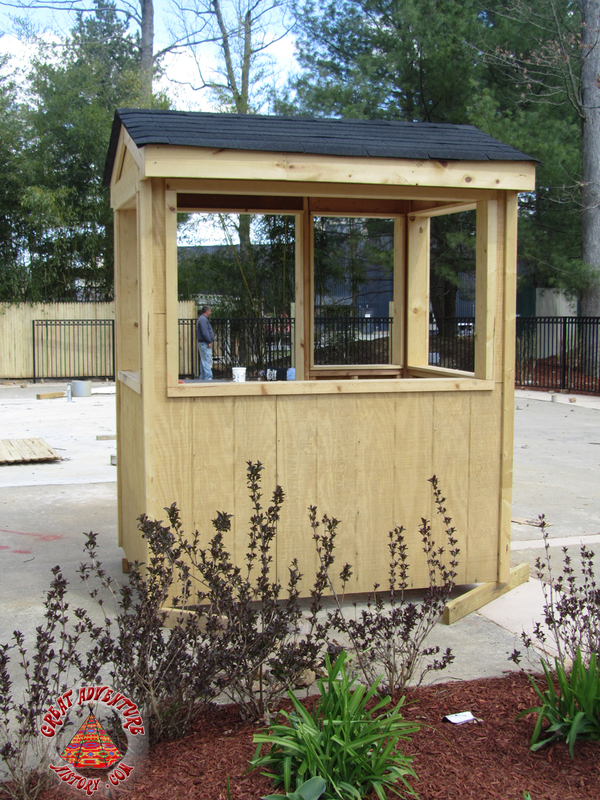 A brand new operators booth was constructed as well, made slightly larger than the Chaos booth that had been on the same site. 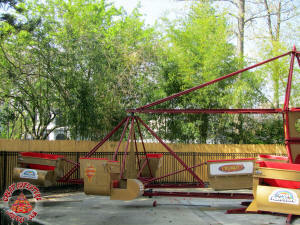 With all the site preparations complete, the ride itself was assembled. 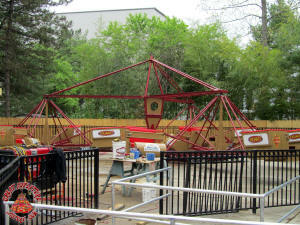 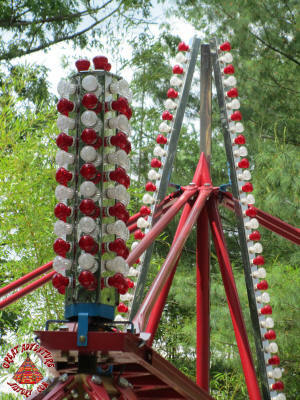 Prior to installation, the ride which had been red, white and blue in Georgia received a fresh new color scheme. 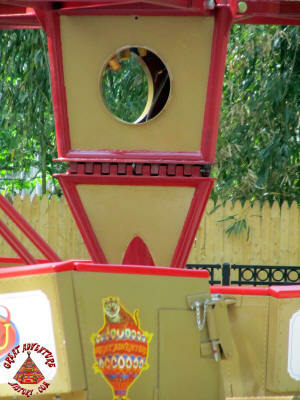 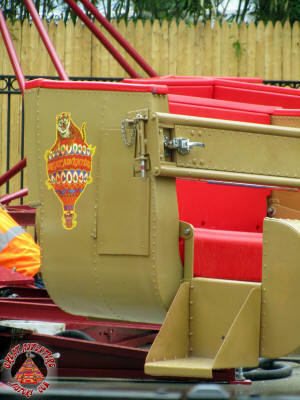 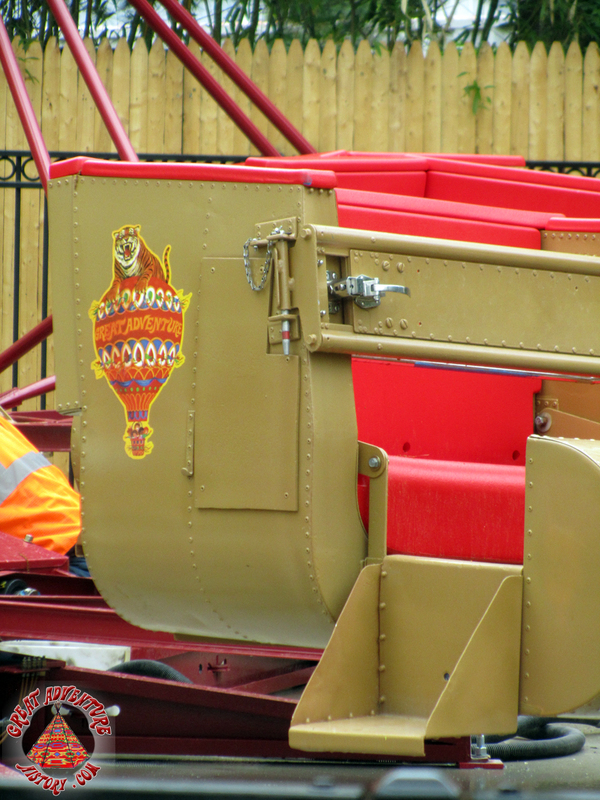 The ride's frame was painted a deep red color with a golden brown color on the ride cars as well as on the central hub panels. 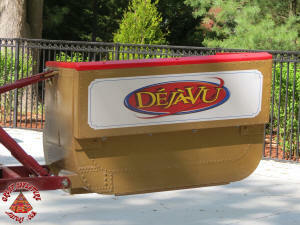 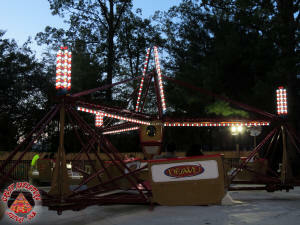 The name Deja Vu was chosen to reflect the re-introduction of the classic ride in the park. 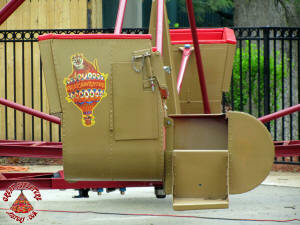 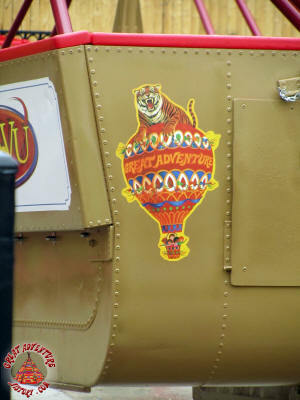 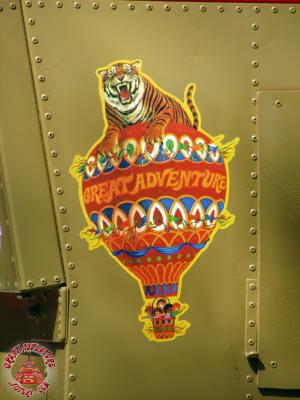 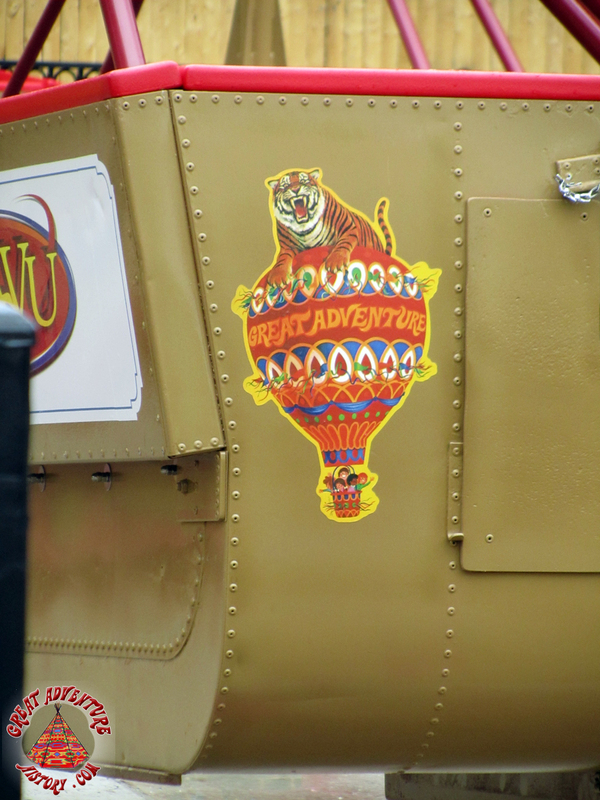 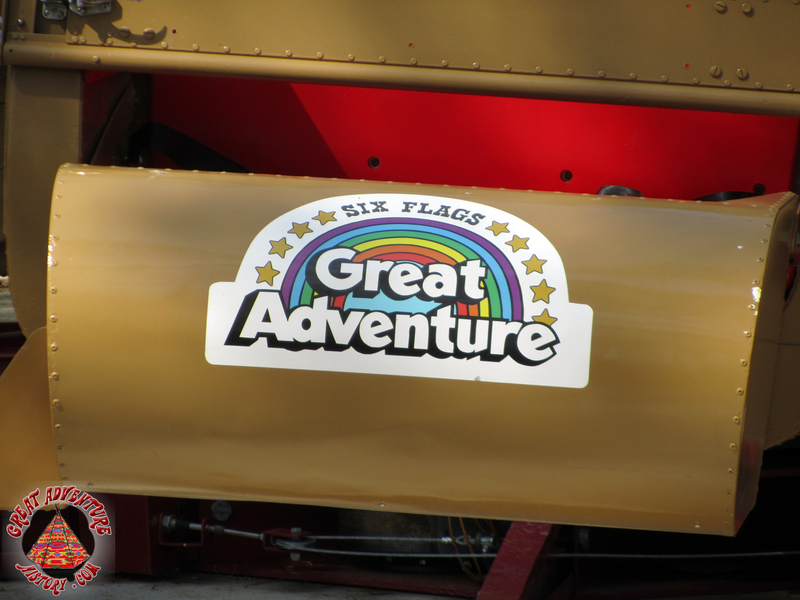 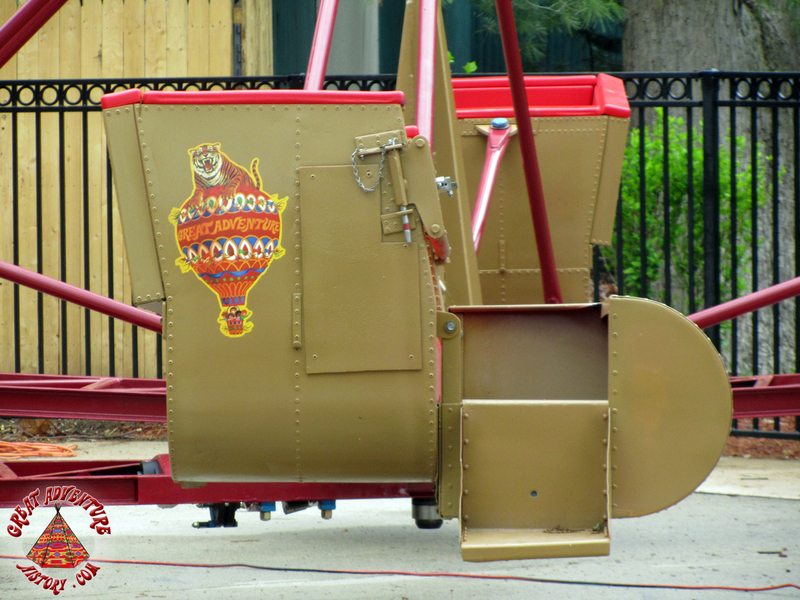 As part of a nod to the park's past, the ride vehicles featured decals of the parks original hot air balloon logo as well as the original rainbow logo that was adopted when the park was purchased by Six Flags. 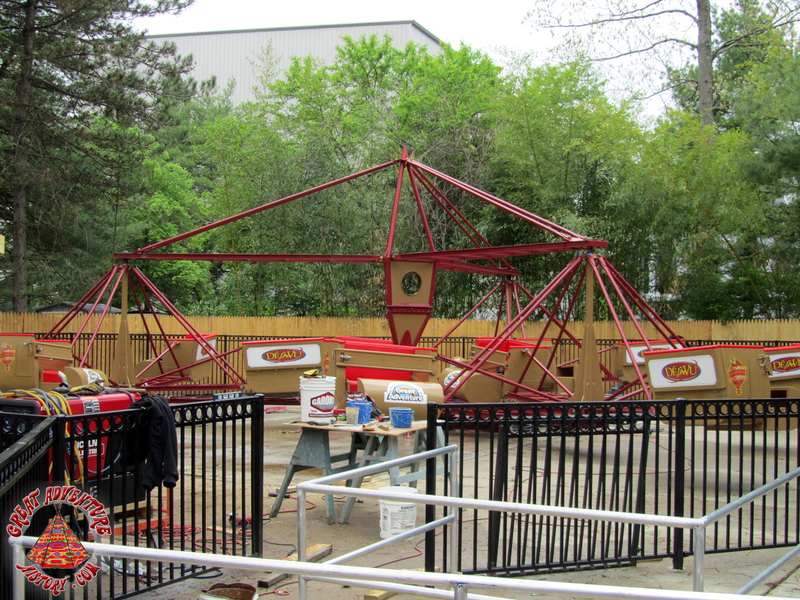 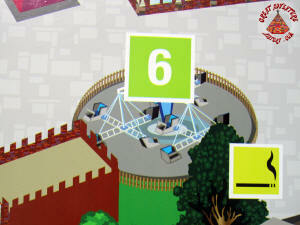 With the ride assembled, the phase of testing, adjusting and training began in preparation for the ride's opening. 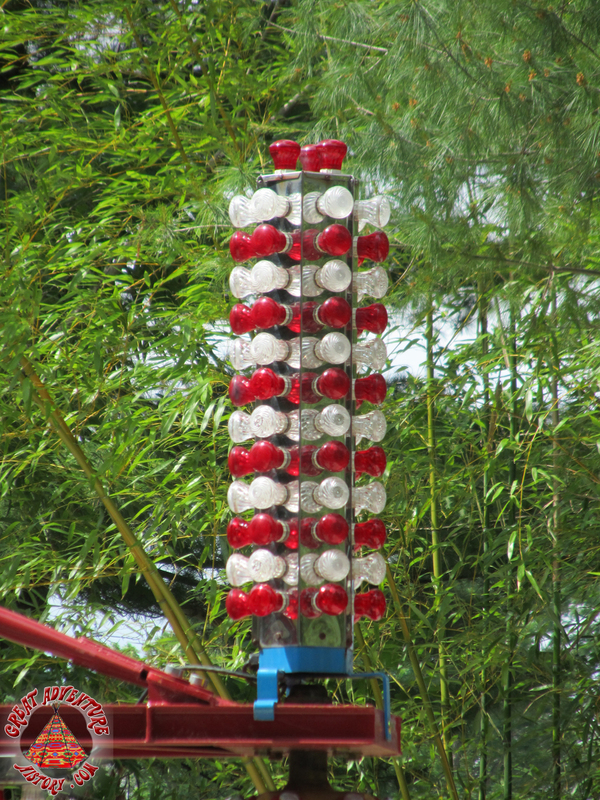 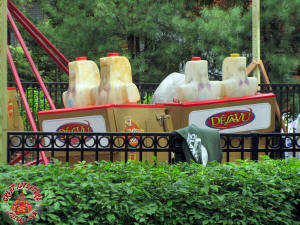 The water dummies spent many hours riding as the final touches were added to the ride. 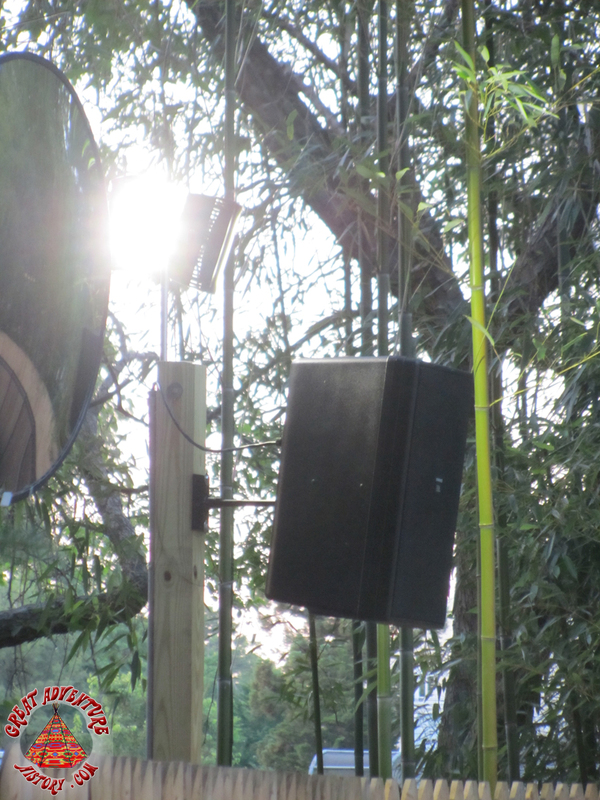 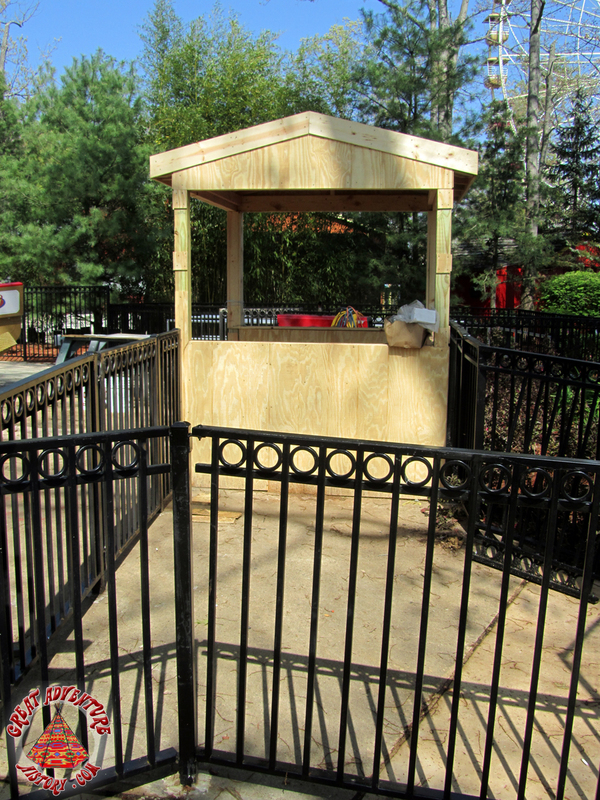 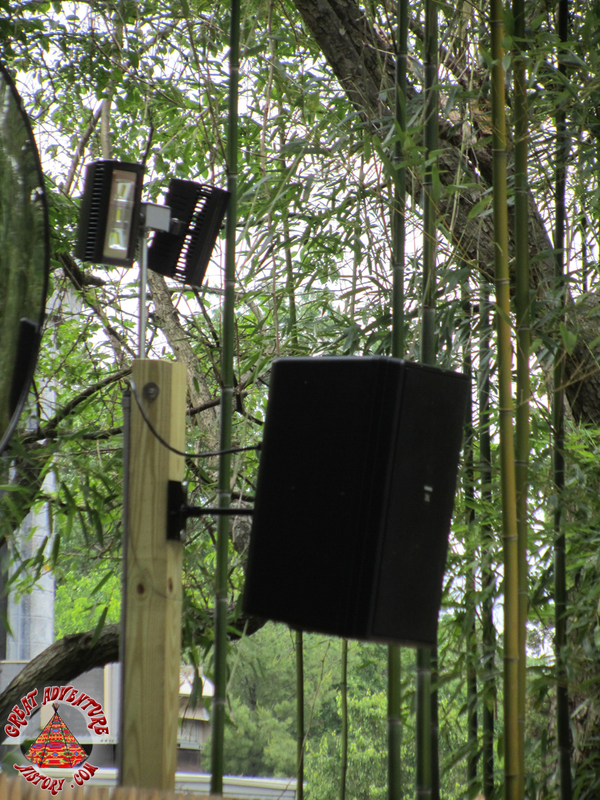 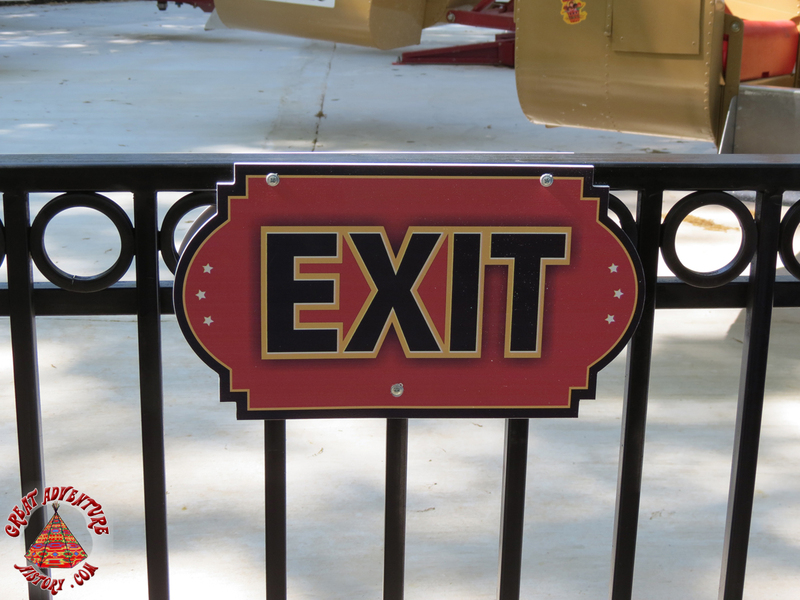 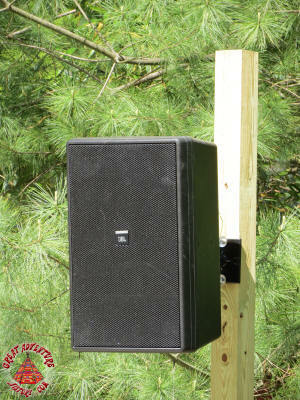 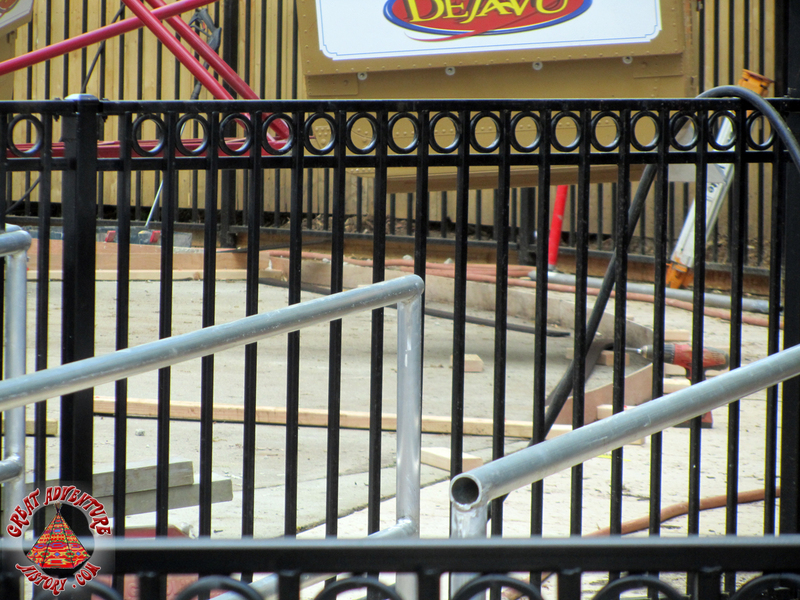 Columns for speakers were added around the perimeter where the ride's classic rock soundtrack would be provided. 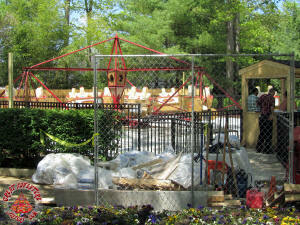 As the month of May continued all of the final pieces came together for the targeted Memorial Day Weekend opening. 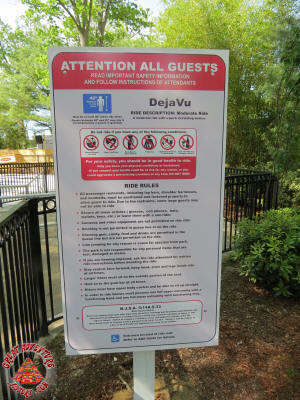 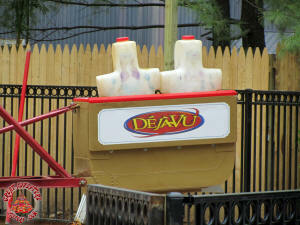 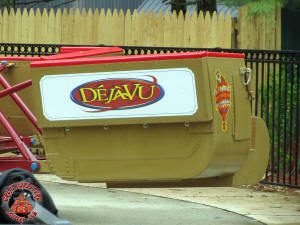 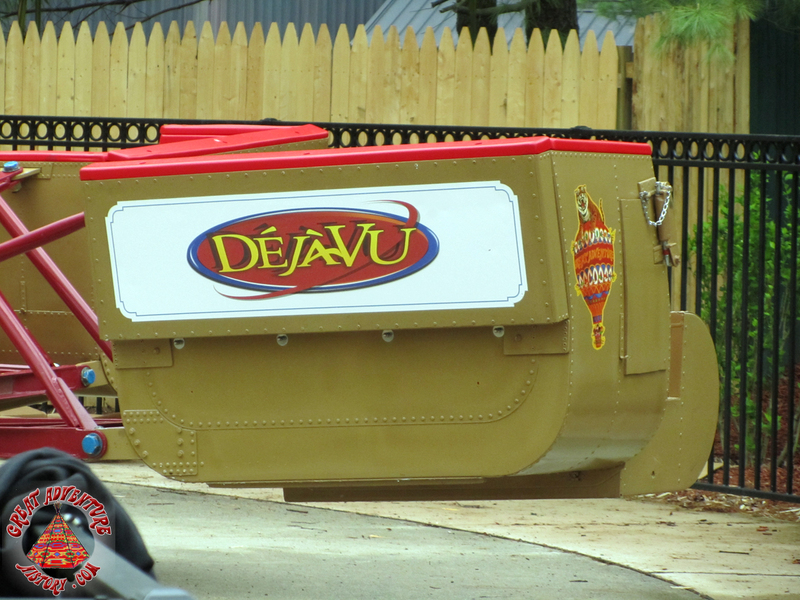 Deja Vu opened to guests and once again the classic ride was delighting guests at Great Adventure. 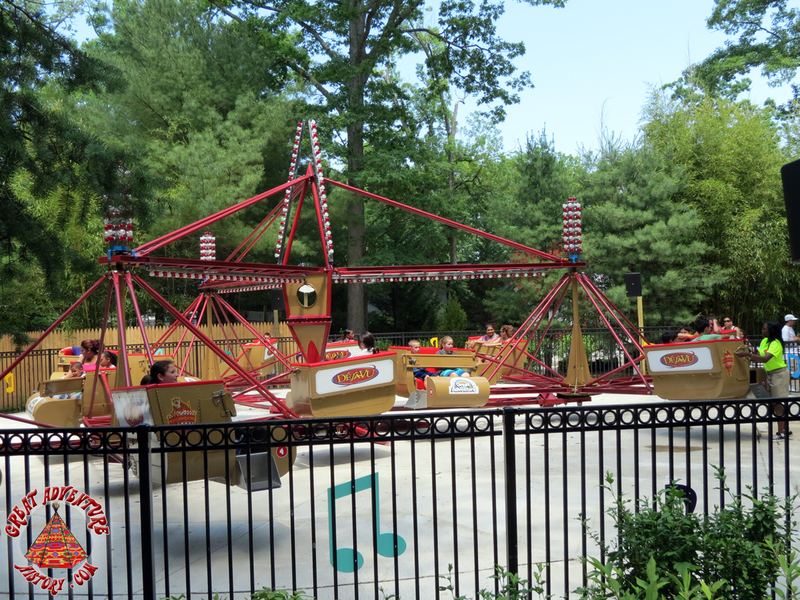 The classic thrills of the Scrambler are still a favorite of many guests, and the ride became a big hit in its new incarnation at Six Flags Great Adventure. 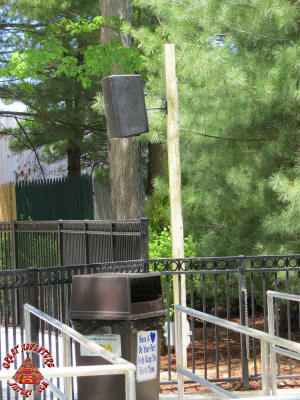 After operating for several weeks, the new lighting package was installed. 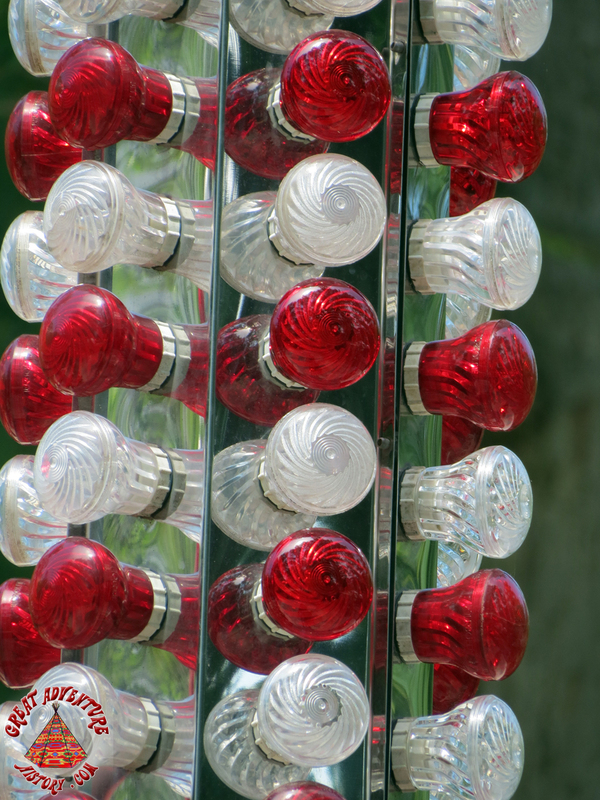 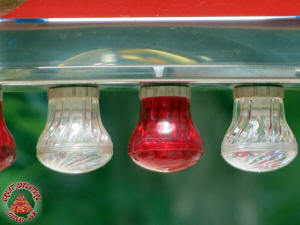 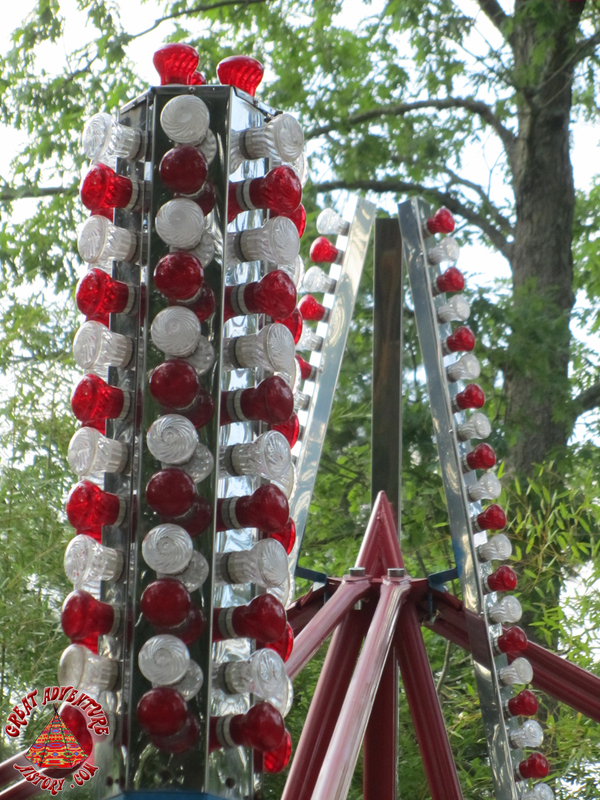 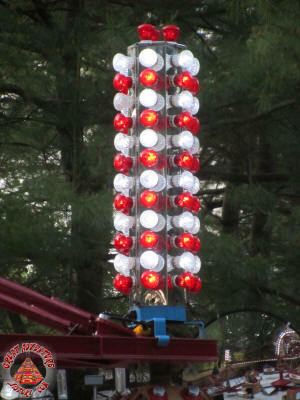 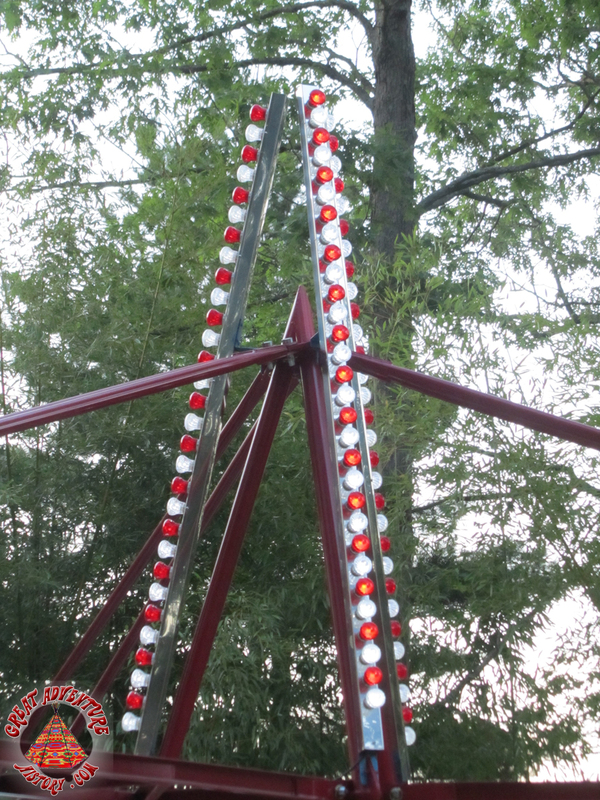 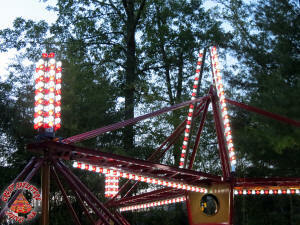 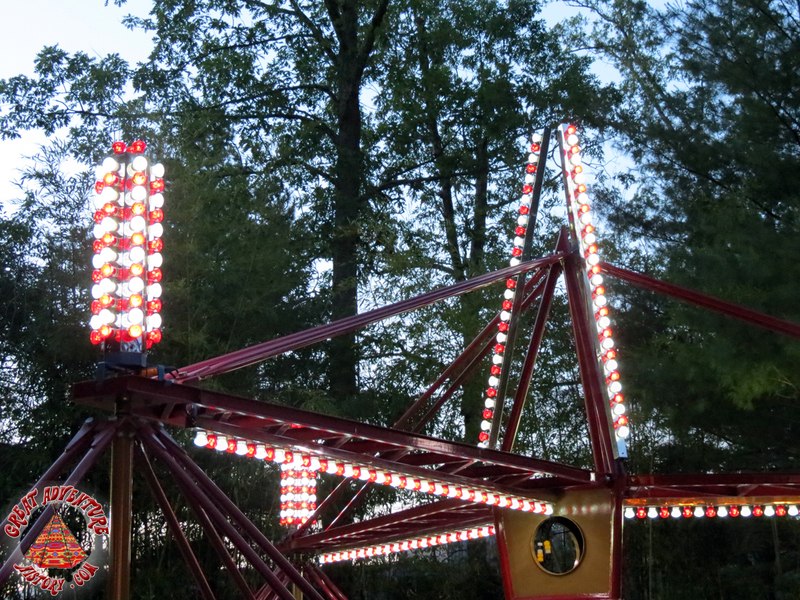 The strips of classic carnival style red and white lights added even more excitement to the ride after dark. 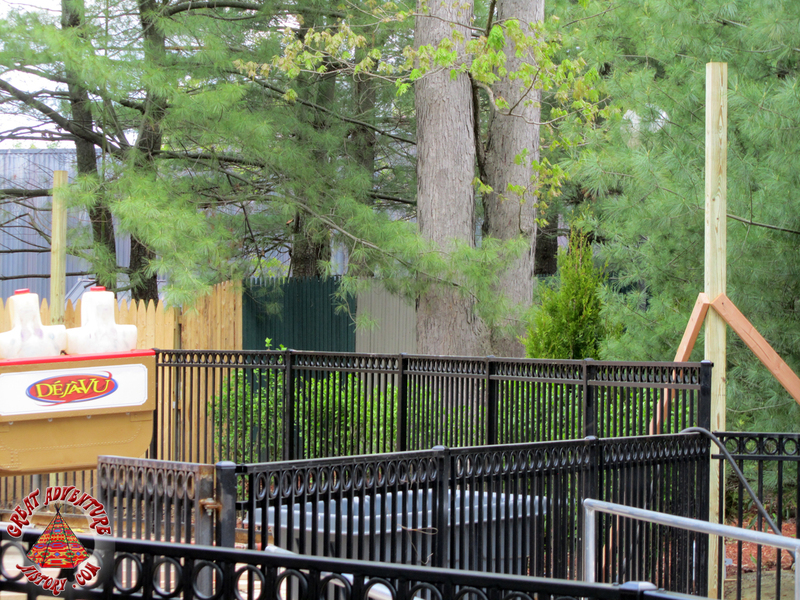 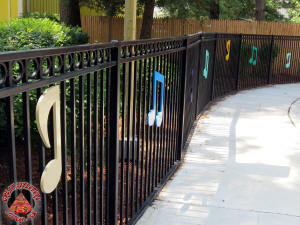 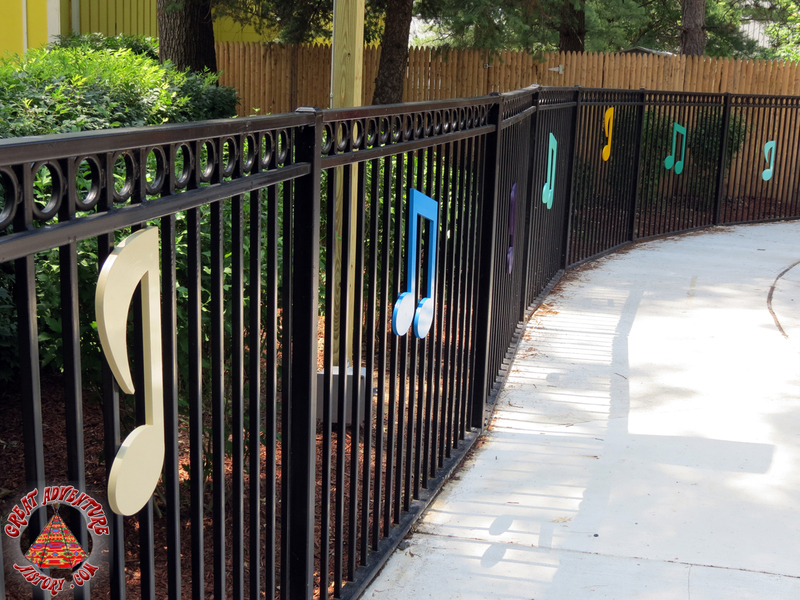 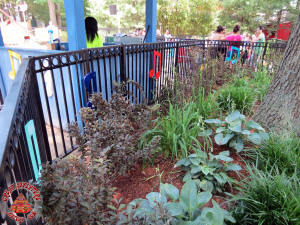 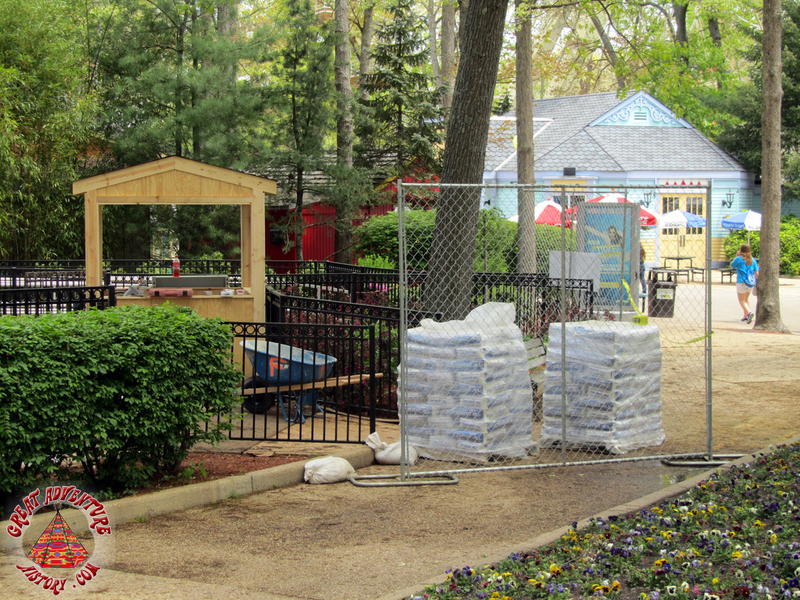 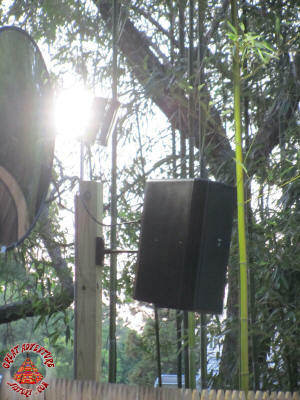 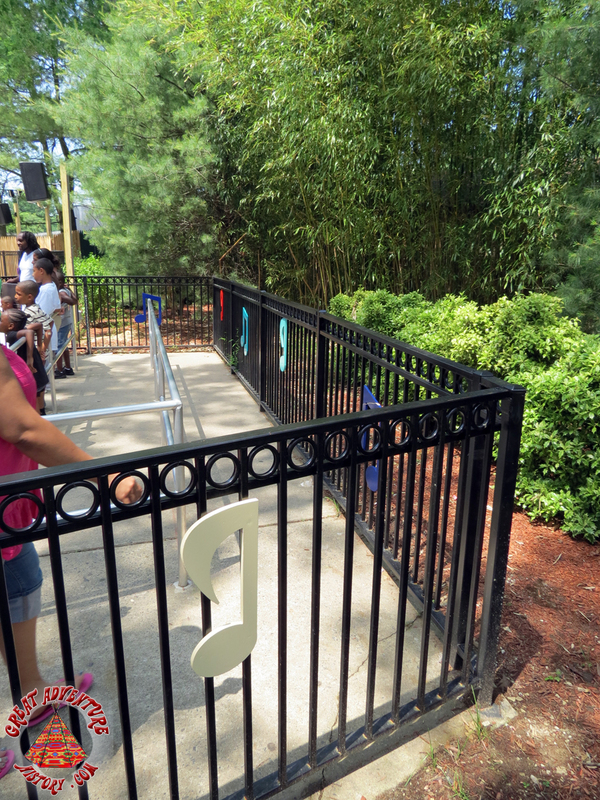 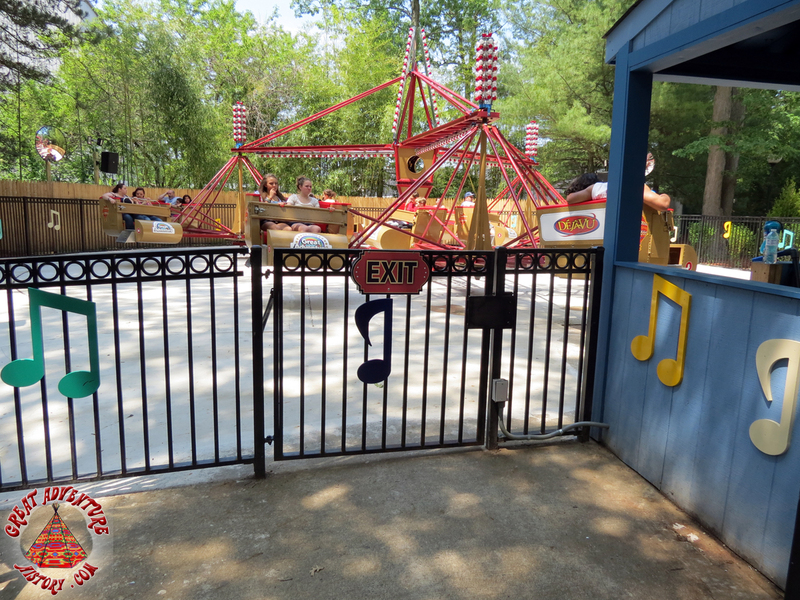 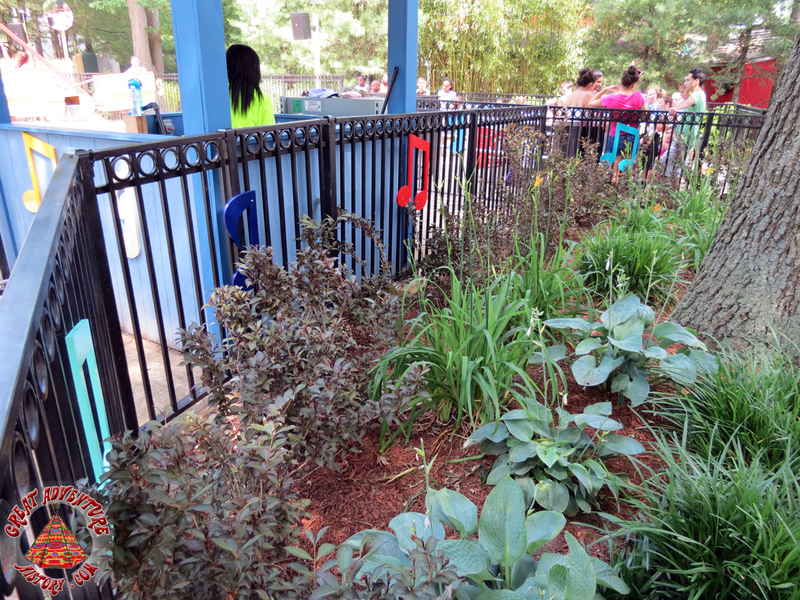 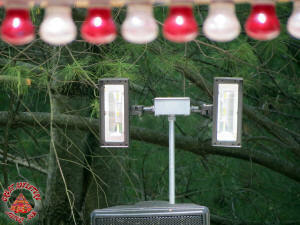 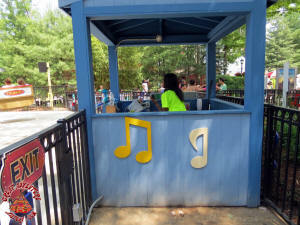 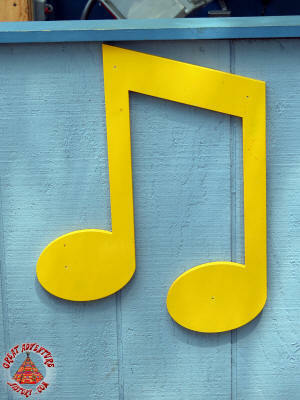 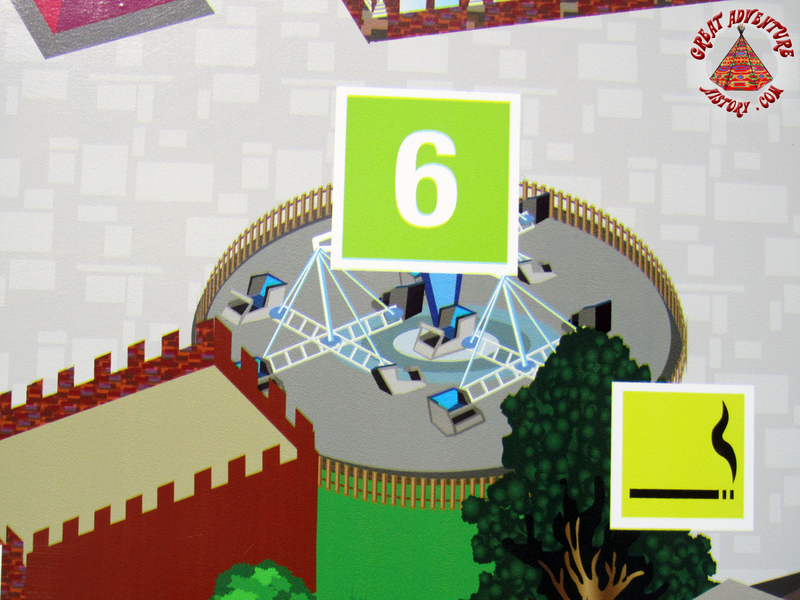 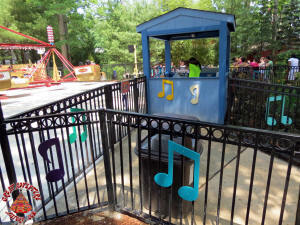 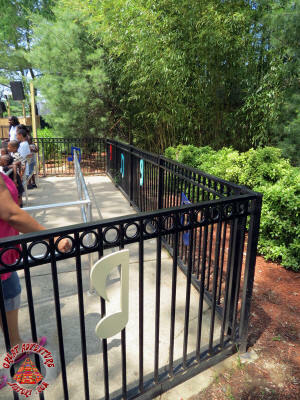 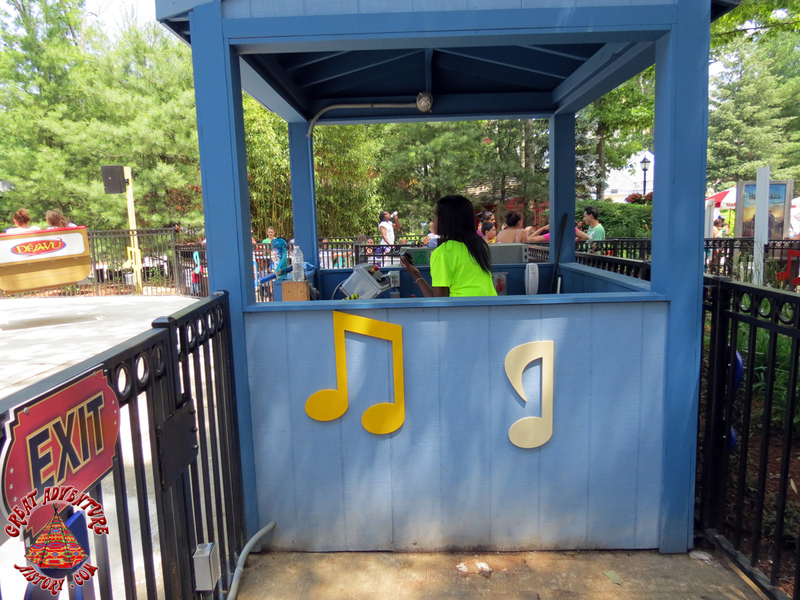 To complete the look of Deja Vu, colorful musical notes were added to the fences and operator's booth. 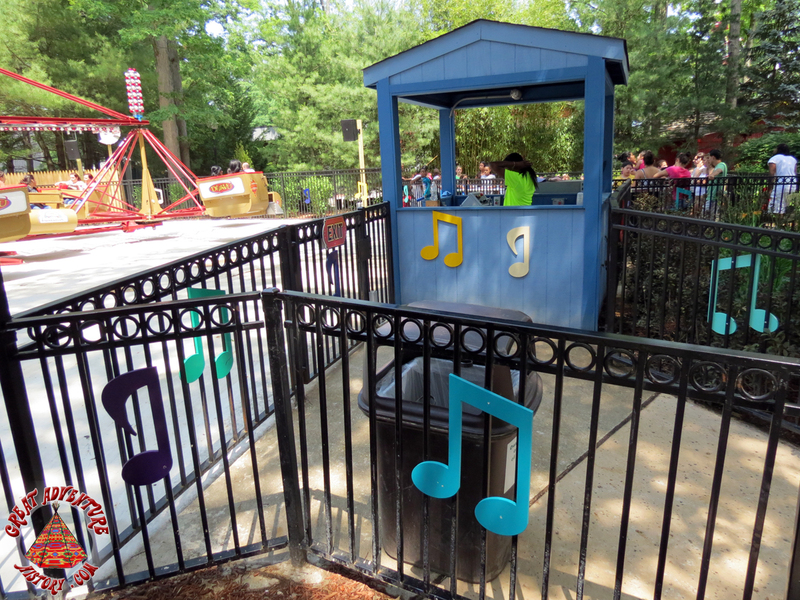 These notes were reminiscent of the decorations from the park's Musik Express ride. 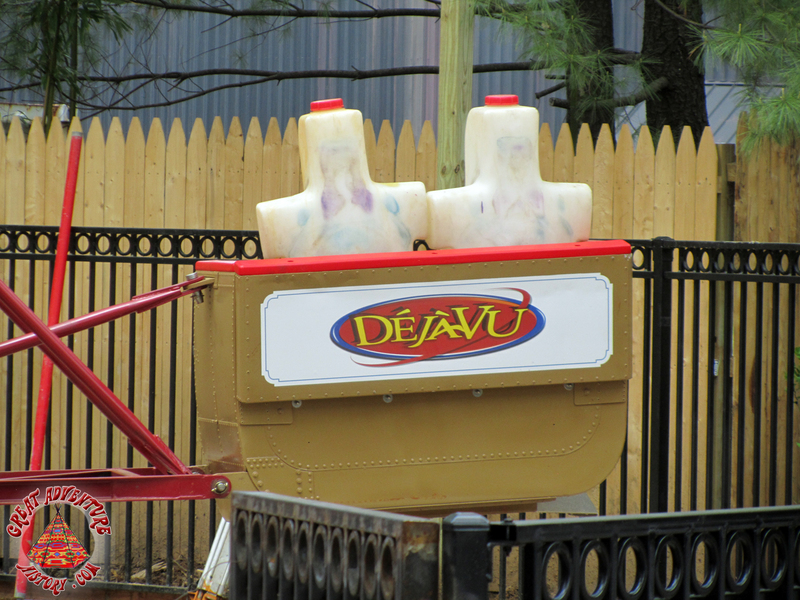 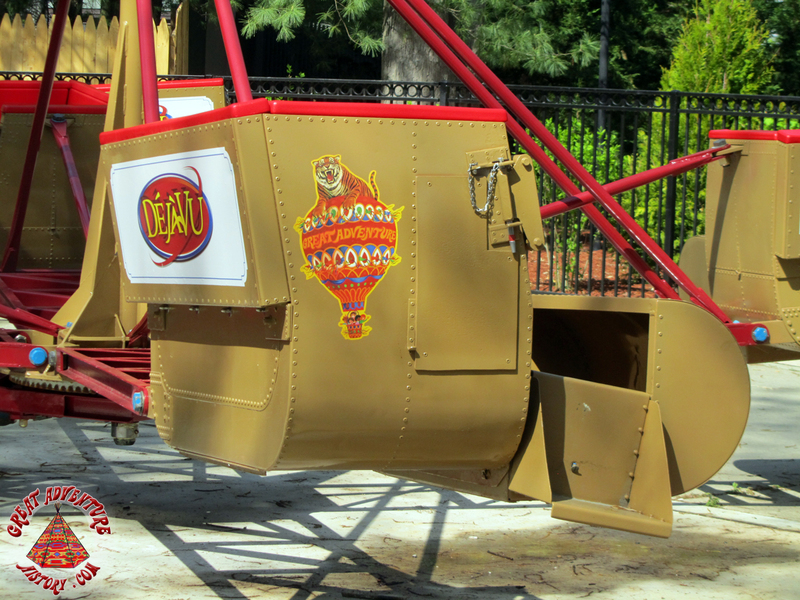 The classics never go out of style, and Deja Vu brought back the classic fun of a much beloved ride to a whole new generation of guests.